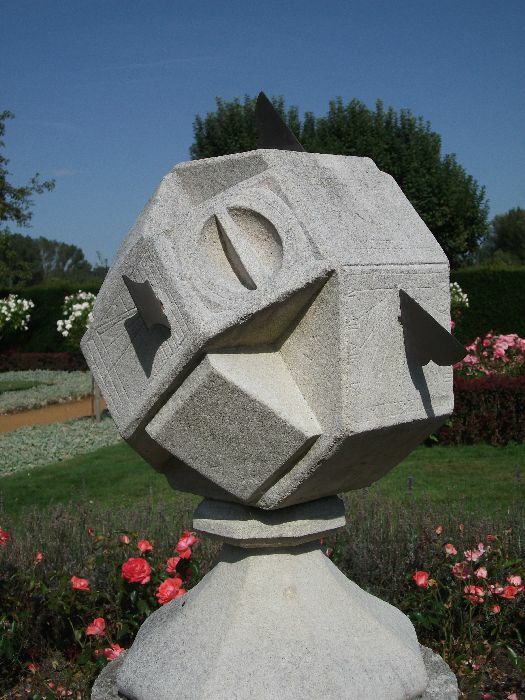 “How do you find the inspiration to design gardens?” is a question I’m often asked. So I thought I’d share one of the ways in which this particular garden designer finds her inspiration to create a practical paradise in your ‘back yard’. A few days away in a different part of the country where ‘things to do’ did not specifically include gardens to visit offered an opportunity to enjoy some different pleasures, including local food and attractions. However, habits are not easy to break, and I still found myself awake early and needing to go out for a run, dog or no dog! The weather was lovely and a walk / run through a local nature reserve was hardly a hardship. On the contrary I had the (for me) rare delight of seeing a Kingfisher; that flash of cyan blue is unmistakable. These birds are such a stunning shade of turquoise, that later, whilst I was sipping my morning espresso, it made me think; turquoise is not a colour we often find in our garden flowers. 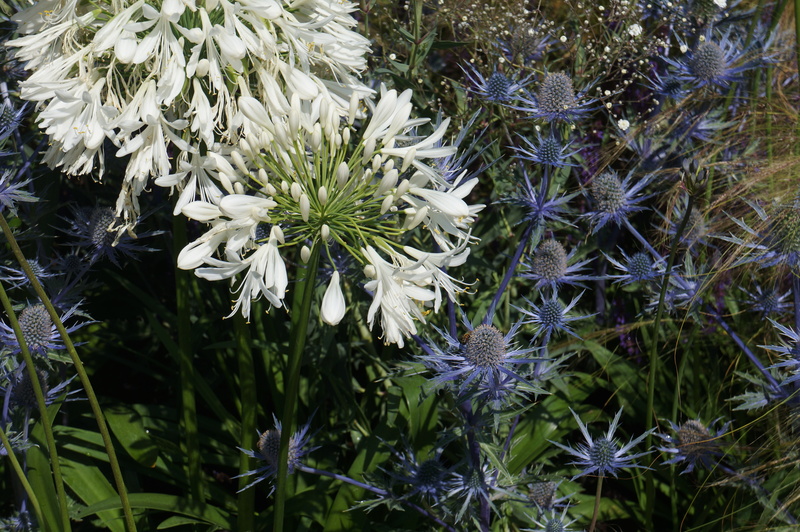 It is one of my favourite colours (along with purple) and I began to ponder on whether it would be possible to have a ‘turquoise garden’ along the lines of the ‘white garden’ at Sissinghurst. Around the feet of the poppies I would grow Forget-me-nots or Myosotis sylvatica. 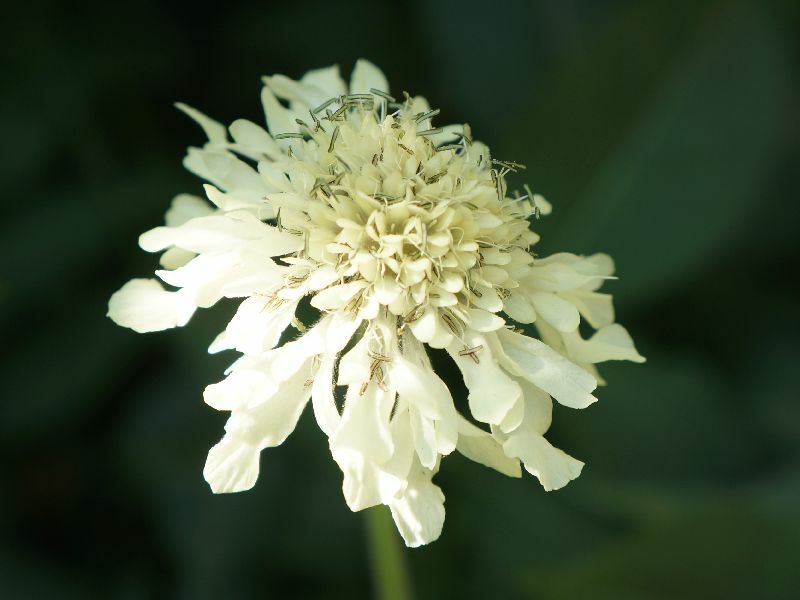 These delightful self-seeding annuals are easy maintenance gardening; let a few of them set seed and you have a guaranteed floral carpet the following spring. 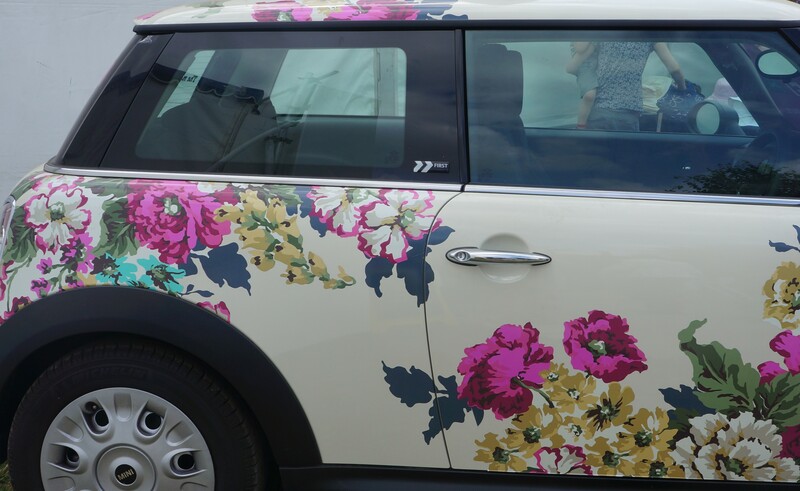 The petal colours are generally a turquoise blue, but pale blue, white and even pale pink variations are all possible. 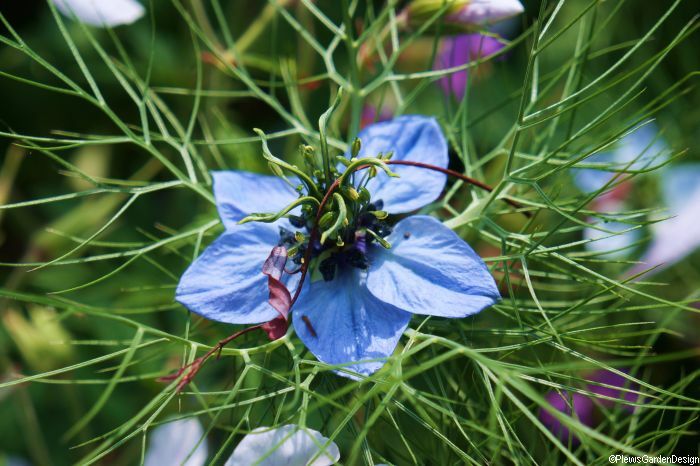 Another annual flower that self seeds so offers low maintenance gardening is Nigella damascena or Love-in-a-mist. 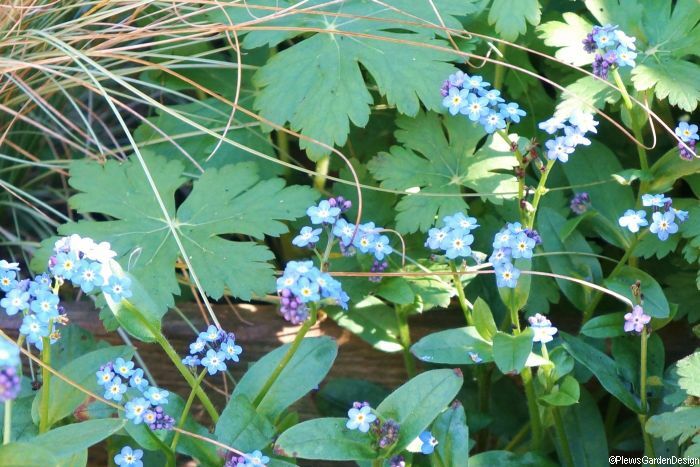 Like the Forget -me-not, there is some variation in the flower colour, especially after a few years, when there seems to be a higher incidence of whites and pale blues amongst the turquoise. This dilution of our chosen jewel colour once a bit of interbreeding occurs can be avoided by preventing the flowers from dispersing their seed. Nigella damascena ‘Miss Jekyll’ has petals that are sky blue but I have in the past found a few rogues in subsequent years to be a cyan tinged sky blue. 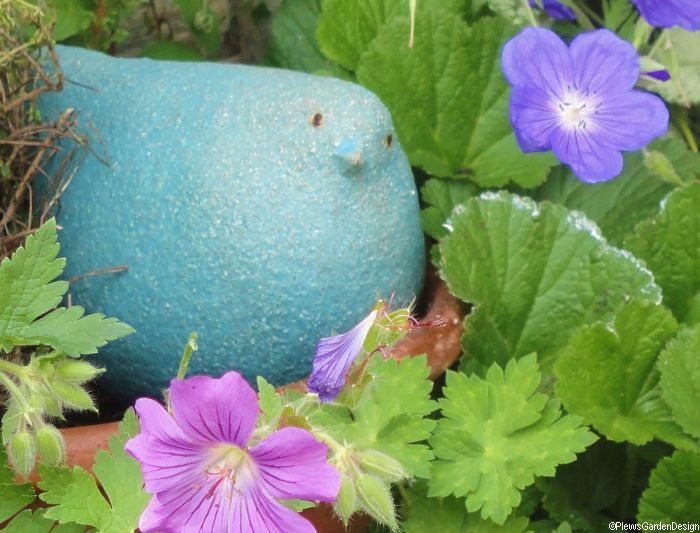 So far we’ve had turquoise flowers in our turquoise garden from April through to July, but the fine weather isn’t over and neither are the turquoise flowers for your garden. We can extend the season with a Hydrangea. 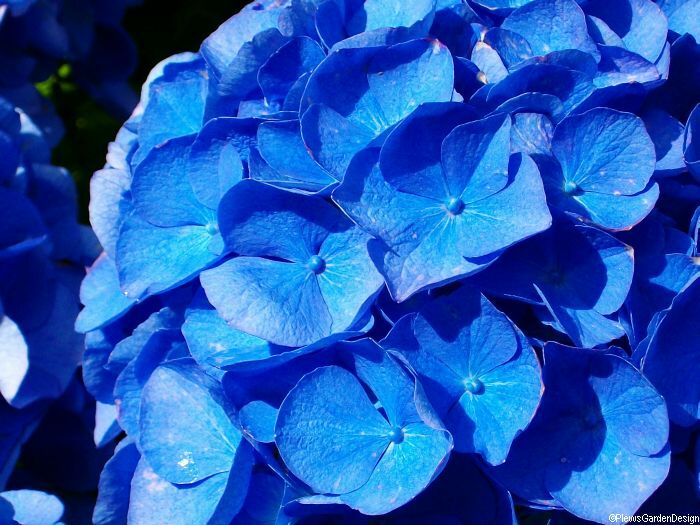 There are plenty of blue hydrangeas and some of these do tend towards a turquoise hue. I particularly like Hydrangea macrophylla ‘brestenburg’, one of the mop head Hydrangeas. Those close packed domes of flowers pack a colourful punch at the end of the summer. Holehird Gardens in Cumbria hold one of the National Collections of Hydrangeas. 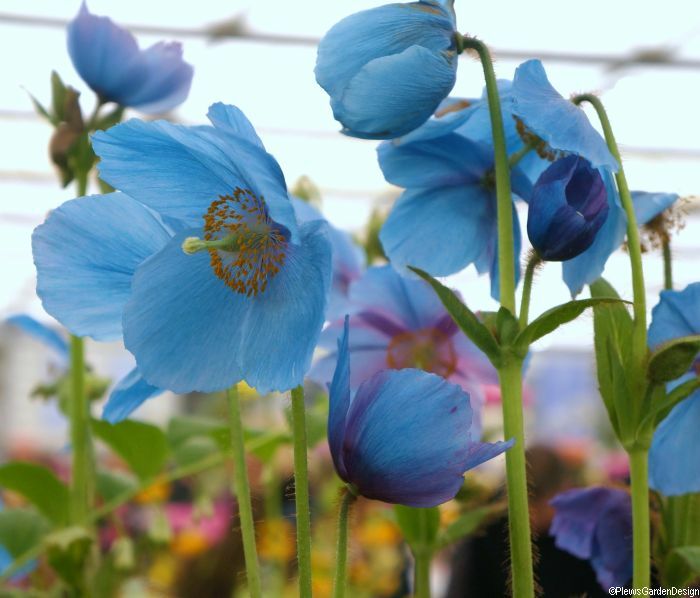 Like the Himalayan poppies we began with, to get the best turquoise blue hydrangea you need an acid garden soil. But also like the poppies it is possible to grow hydrangeas in a raised bed or (large) pot if your soil is not right. Both the Forget-me-nots and the Love-in-a-mist are easy to give the right soil to as they’re fairly tolerant; to the extent of seeding themselves in the cracks between paving stones. Seedlings in the wrong place are easily lifted and thrown onto the compost heap. So a turquoise flowering spring and summer garden is possible. As for what other flowers and foliage would complement or contrast the turquoise – well, why not drop us an email and ask about our planting design service? 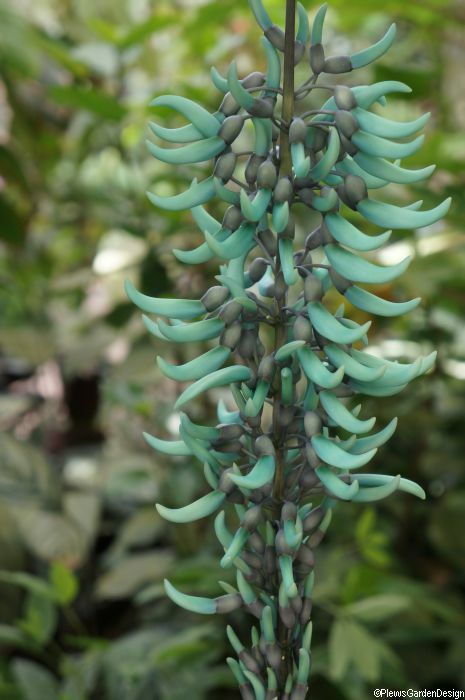 I couldn’t finish this blog about turquoise flowers without mentioning the (not quite turquoise) Jade Vine (Strongylodon macrobotrys). This tropical beauty, seen here in the RHS Wisley glasshouse where it has produced a record number of hanging flower trusses this year. 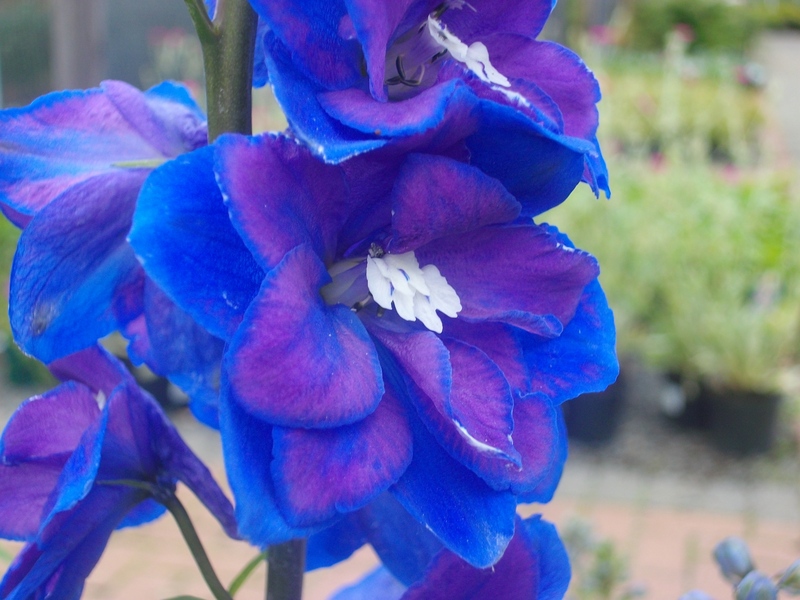 This climbing Philippine native produces flowers of a stunning aquamarine colour; you can see it at Wisley, Kew and in the botanic gardens of Oxford and Cambridge Universities; it flowers from April – July. 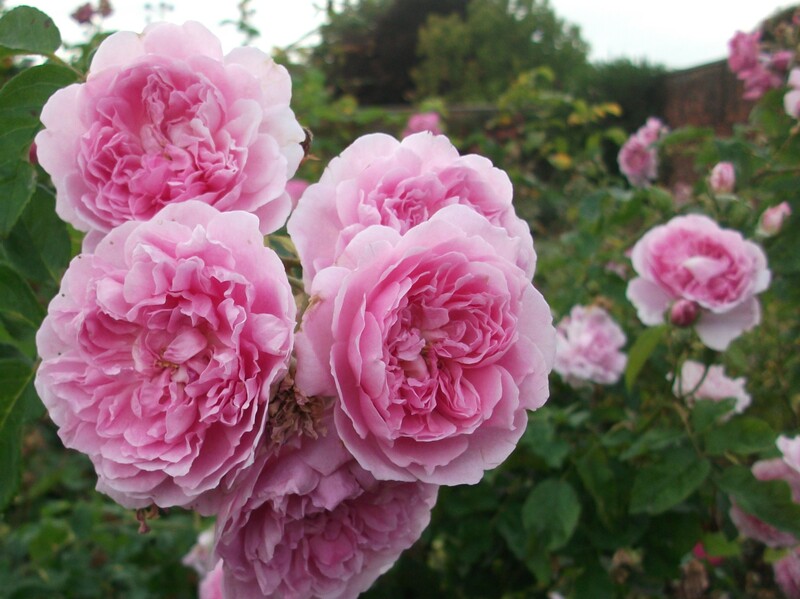 Rose gardens – can you smell the scent of paradise? 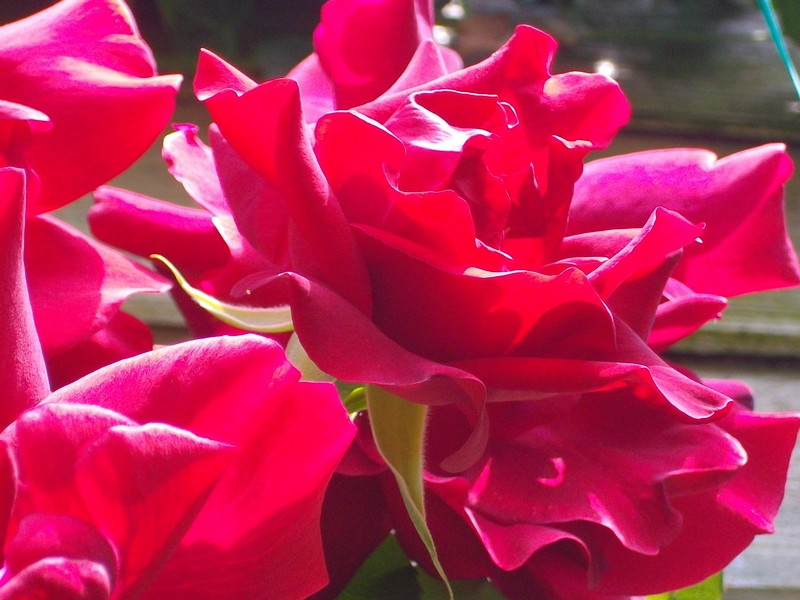 Roses are one of those flowers that need to have a perfume. There’s such a choice from delicate through to musky that it seems a waste of the olfactory sense not to have aromatic roses. 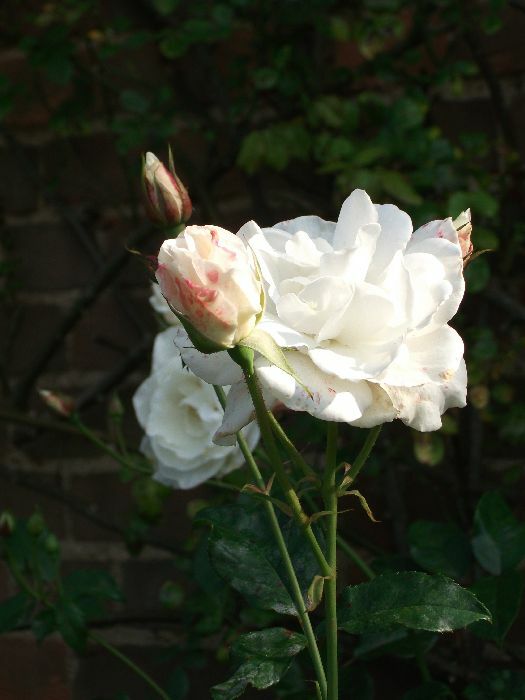 Roses have a long history in our gardens, and while Rose gardens waver in and out of fashion; roses themselves never totally leave the worldwide top ten favourite flowers list. This is a small selection of some of the rose gardens we’ve visited in the last year or so. 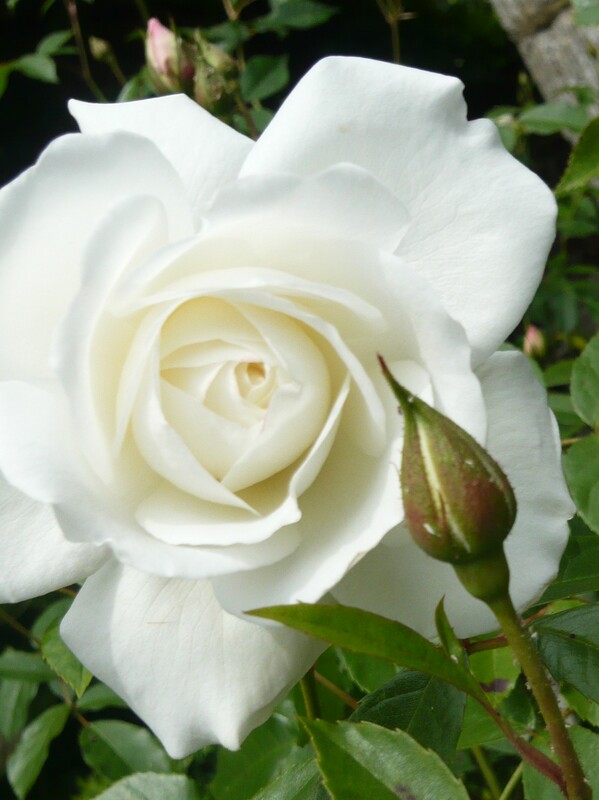 They are gardens which are purely a rose garden, or are a separate rose garden within larger gardens. 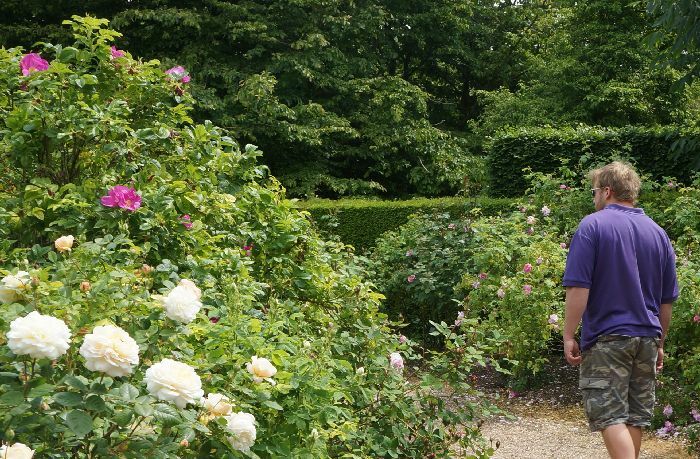 Unfortunately the internet doesn’t yet have a ‘scratch and sniff’ facility, so you’ll need to use your imagination, but the warm sun certainly brought out the exotic and subtle scents for us to enjoy when we visited these rose gardens. 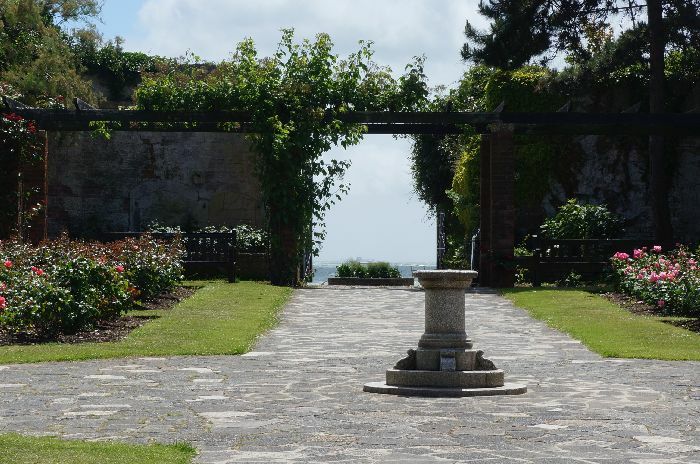 Southsea Rose Garden in Portsmouth has been developed on the site of a Victorian fort – ‘Lumps fort’ on the esplanade. 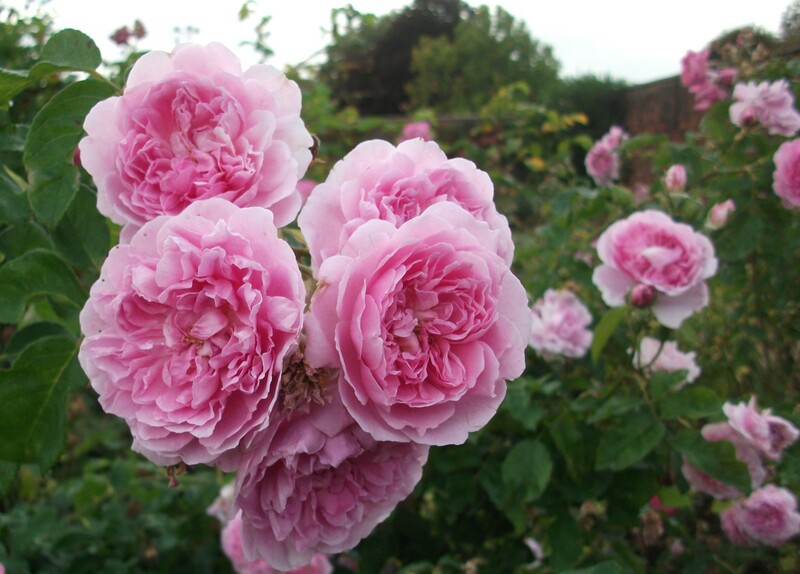 High walls surround the roses, and this helps retain their delightful scent, as Portsmouth is notoriously gusty! 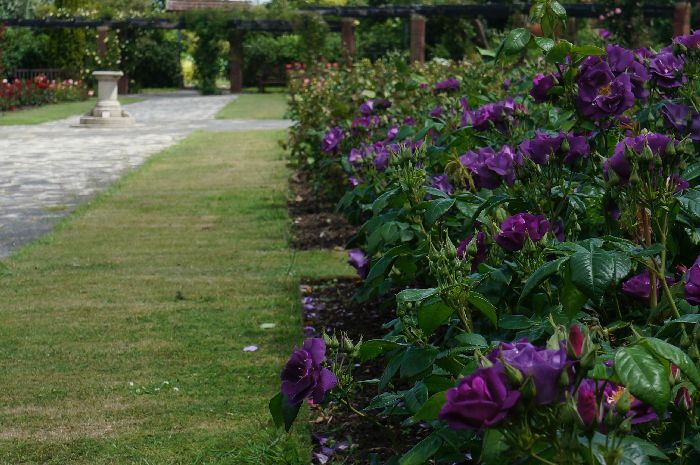 Not all rose varieties like the salty air but this garden has a selection well beyond the trusty Rosa rugosa. 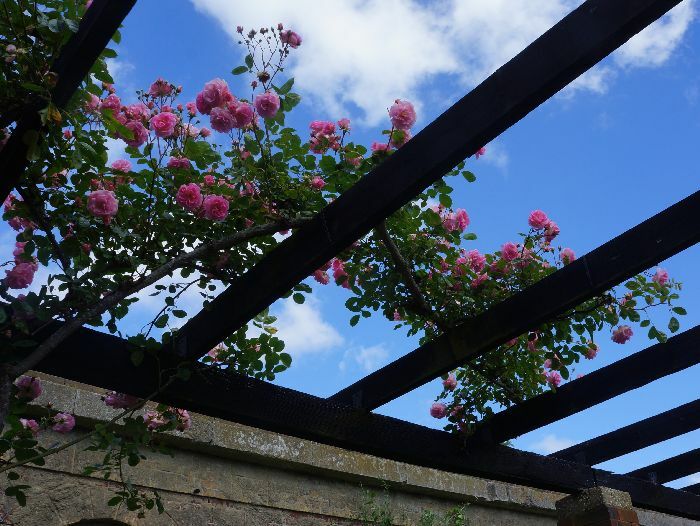 Good use is made of the brick pergolas with roses climbing up and over these; and the axis of the main avenue has the sea beyond as its focal point. 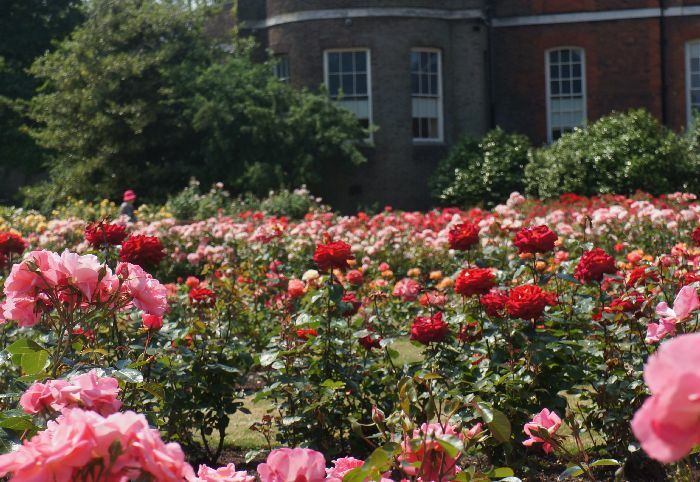 The Rose Garden in Greenwich Park lies next to the eighteenth century Rangers House, at the top of the hill; more Blackheath than Greenwich. 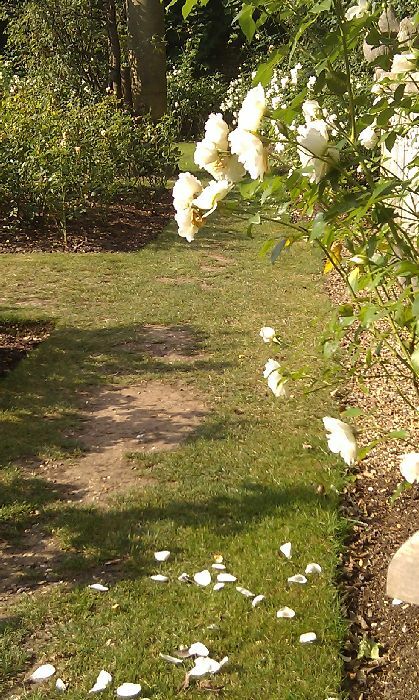 The arc shaped beds give a long vista of roses and allow a strolling between borders with opportunity to stop and sniff. 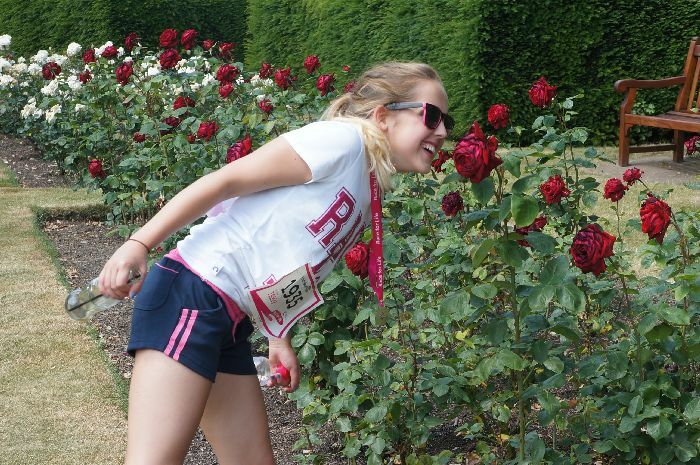 We visited after the ‘Run for Life’ in aid of cancer and were particularly pleased to find that our favourite rose for scent and colour combined was Rosa ‘loving memory’. In Nymans rose garden (a rose garden within a larger garden) it was interesting to see the use of some companion planting; in this case, Nepeta, or catmint. 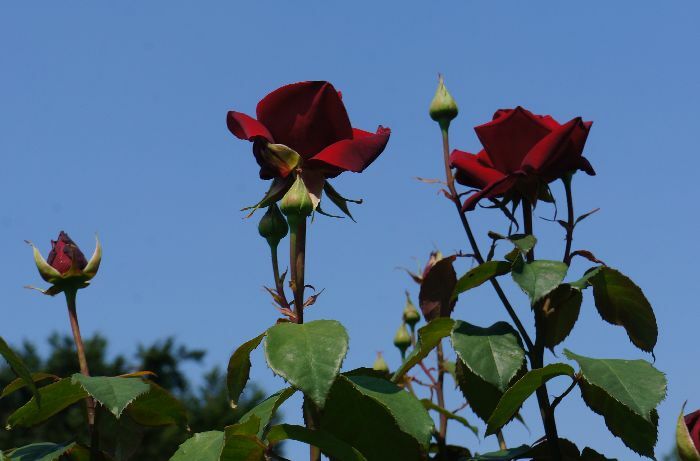 Roses, like many plants, thrive when planted in a community rather than as a single species. 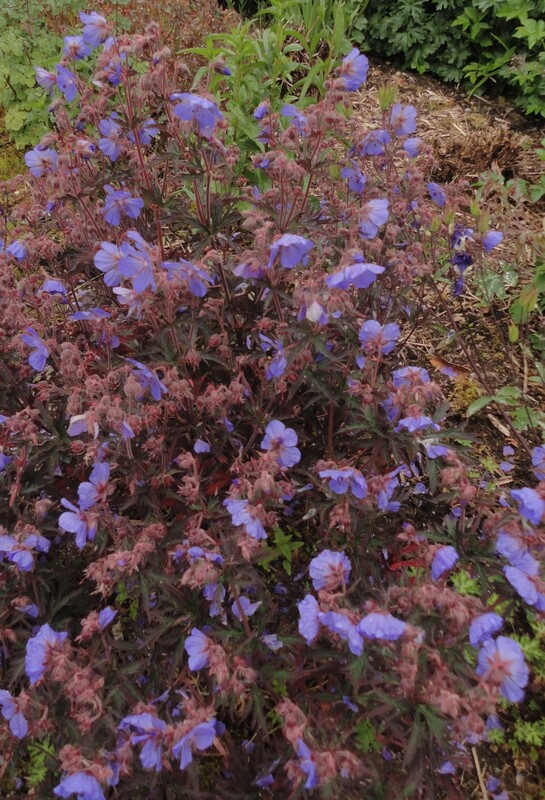 Nepeta offers both aesthetic companion planting with soft foliage and purple blue flowers complementing all the roses in the garden, but also ‘true’ companion planting, as it helps deter pests. Still with the companion planting, we spotted this standard rose surrounded by lavender in Hever Castle gardens, although not in their delightful walled rose garden. 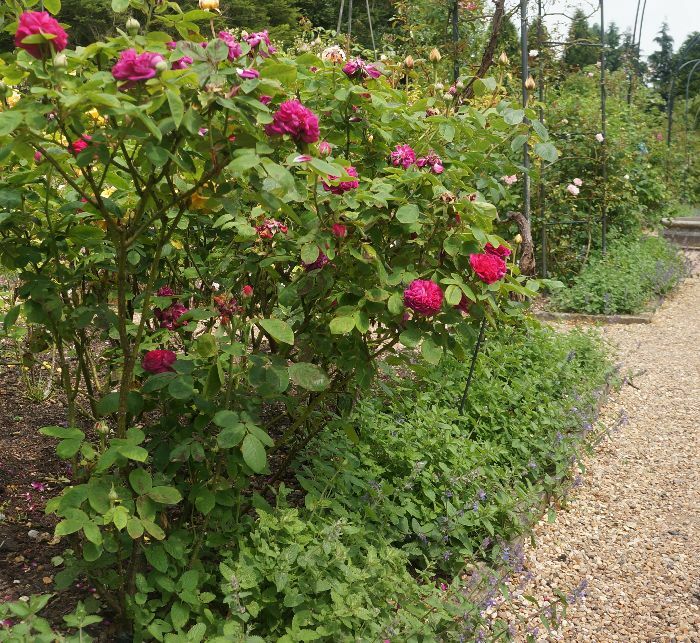 At Penshurst Place, the rose garden also sports companion planting. Furry leaved Stachys byzantina offers a silver ground covering carpet with purple flowers spikes in summer. Paired with white flowering standard roses this is a subtle combination and one to copy in any sunny border; perhaps one rose at each end of the border with Stachys below, then the rest of the border filled with Santolina, Lavender and white Lychnis coronaria: lovely. 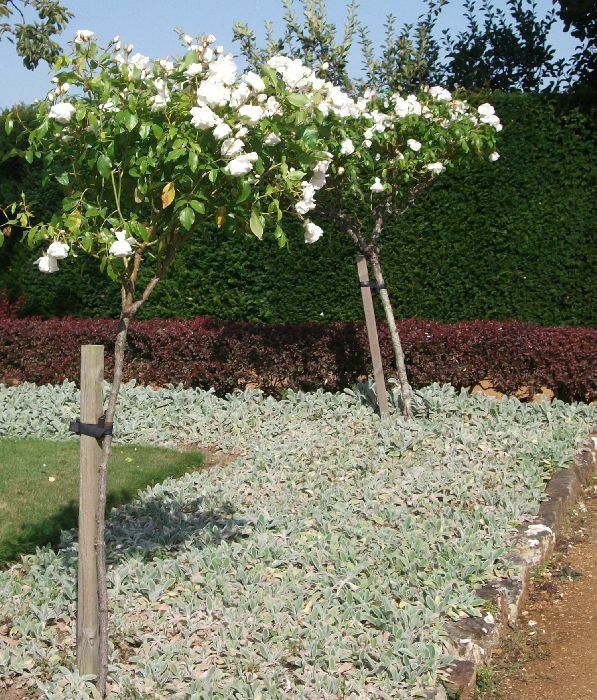 The silver foliage planting I’ve just suggested as a design idea for a south facing border would look good all year as, except for the rose, the planting is all evergreen. 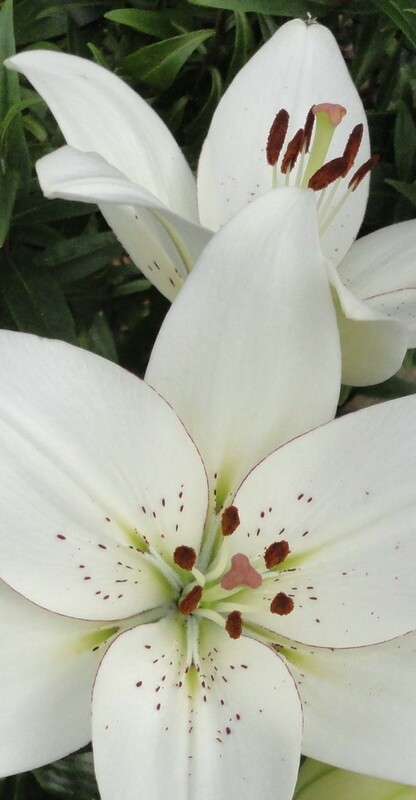 The bees would love it too. Sitting in the garden enjoying the sun or sitting on a cool veranda in the shade? 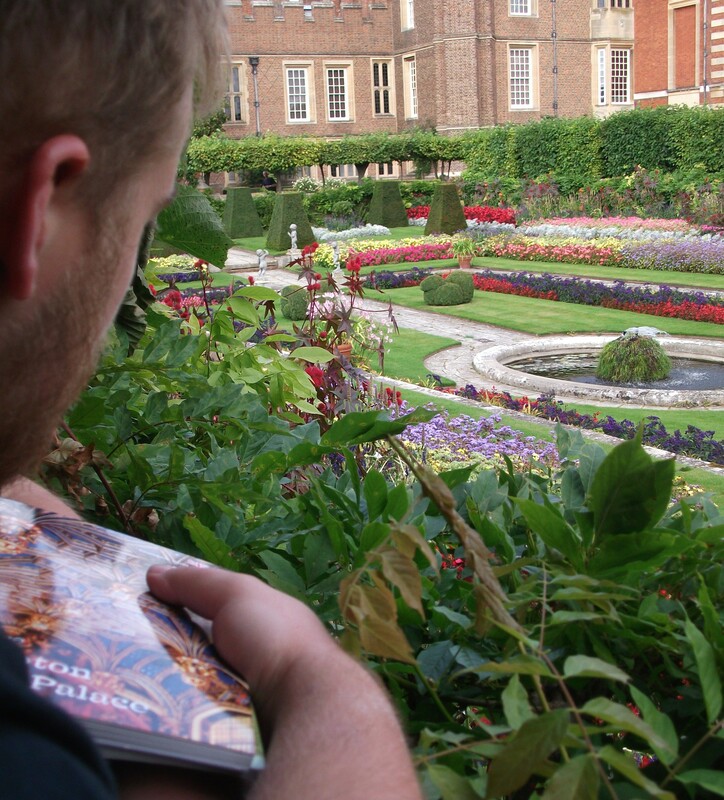 “In Your Summer Garden with Plews Garden Design” – the newest in our series of Gardening Almanacs makes good reading wherever you are. Most established planting, both shrubs and herbaceous perennials, should be fine without watering by you, whether you’re at home or away. This does assume that the soil is good and that the plants have been chosen correctly, shade lovers in a sunny border are not going to be happy, for example. 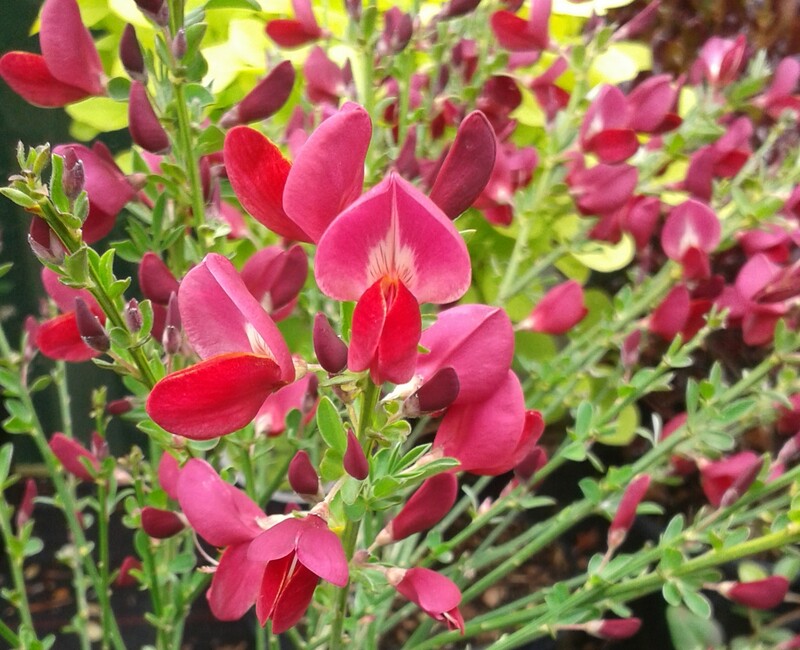 This isn’t a blog about drought tolerant planting (that’s another one) but some suggestions for planting that will be quite happy if you ignore it and don’t water it, don’t deadhead it but simply admire it. I was considering the idea from a ‘going on your summer holiday’ perspective, but the plants are easy maintenance once established so would of course be happy in your garden at all times of the year. The term architectural planting generally describes tall, statuesque plants often seen in very contemporary gardens, although it also includes ornamental grasses, Phormiums and bamboos. 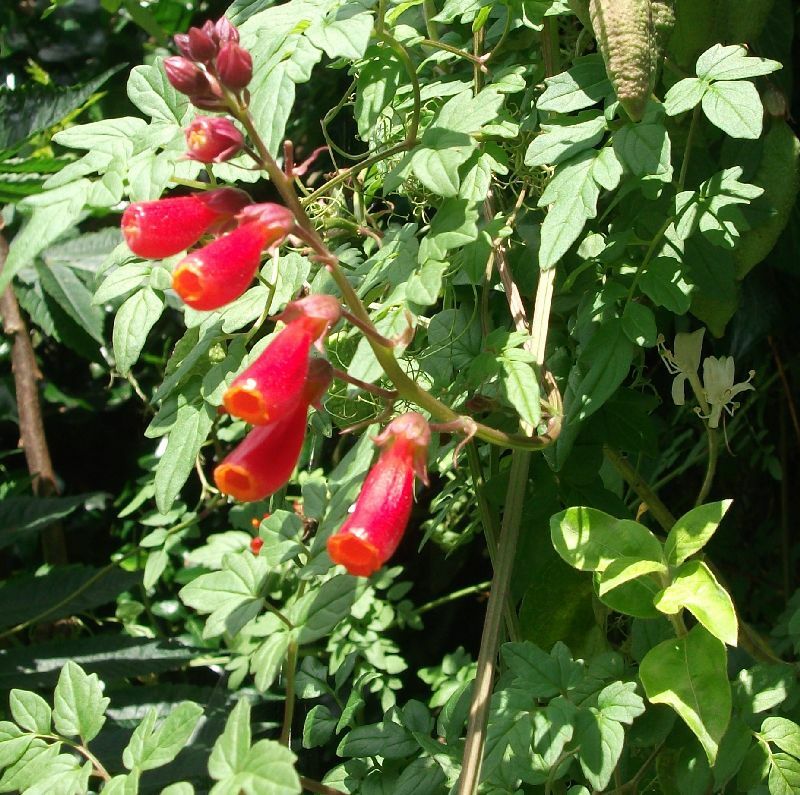 People are often put off from choosing some of these plants, concerned that they may not fit into a mixed border, or might be too big for their garden. 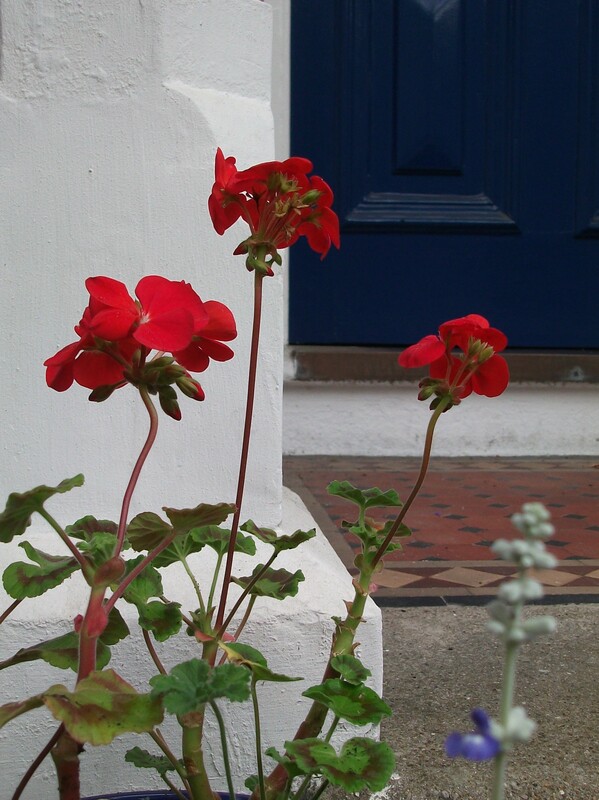 Generally speaking though, adding a ‘wow’ plant can really lift a border, giving it a new lease of life. Architectural plants may be herbaceous perennials, annuals and shrubs as well as ornamental grasses and bamboos, and it is herbaceous perennials that I’ll be suggesting as if it’s your first foray into architectural plants you may feel reassured by the domestic familiarity of plants which die back over winter and shoot up in the summer. 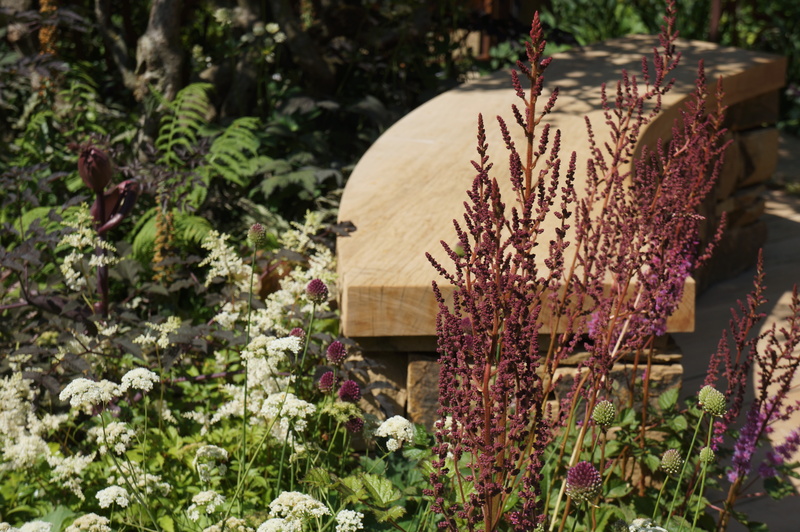 The plants will work as part of cottage style planting, minimalist and contemporary gardens, many historically inspired schemes (the Victorians in particular were great Plant hunters and introduced quantities of species to Britain). They’ll also be useful in potager and ornamental kitchen gardens as pollinating insects and predator insects will be encouraged in by their flowers. 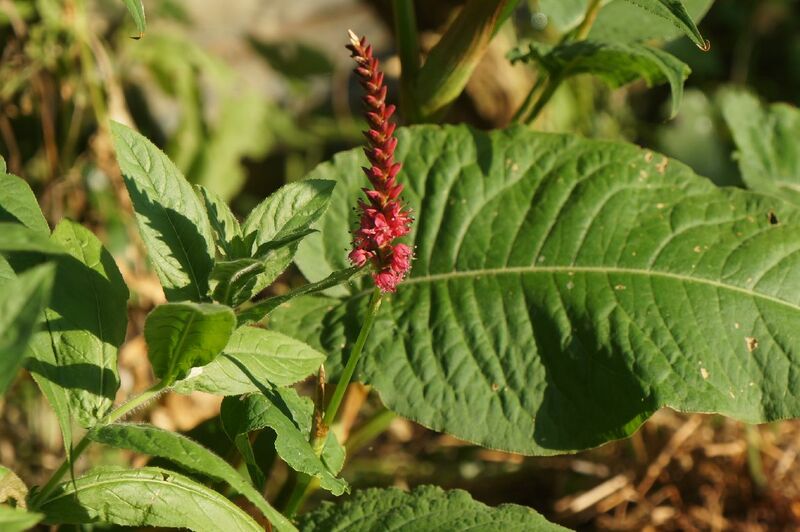 Persicaria are members of the knotweed or Polygonaceae family, but are now often referred to as smartweeds, rather than knotweeds to distinguish them from their invasive cousins. Persicaria like a moist or damp soil and will tolerate shade partial shade and sun, but this latter with moist soil, or it will droop and look unhappy. 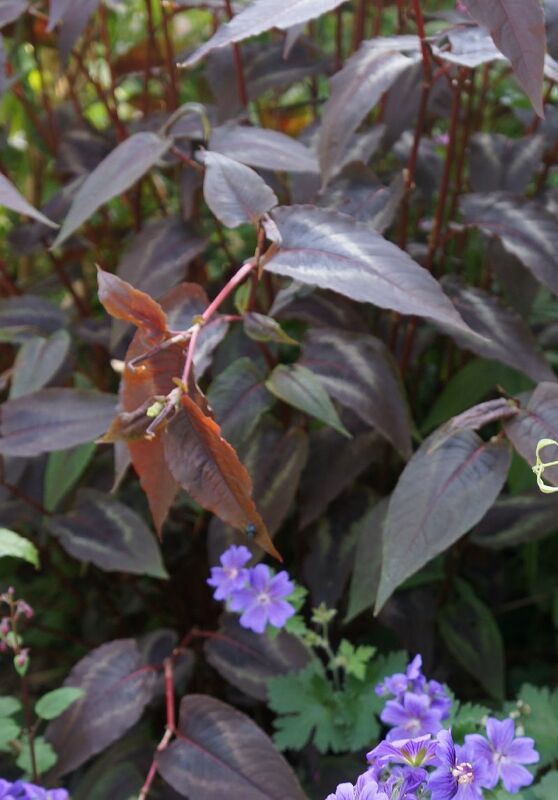 There are a range of varieties to choose from, with the dark pink flowered Persicaria ‘firetail’, the bronze leaved Persicaria microcephala ‘red dragon’, and the edible Vietnamese coriander, Persicaria odorata. Acanthus mollis, ‘bear’s breeches’ is a wonderfully architectural herbaceous perennial that is drought tolerant, so will not notice if you’re away on your holidays and haven’t watered it. 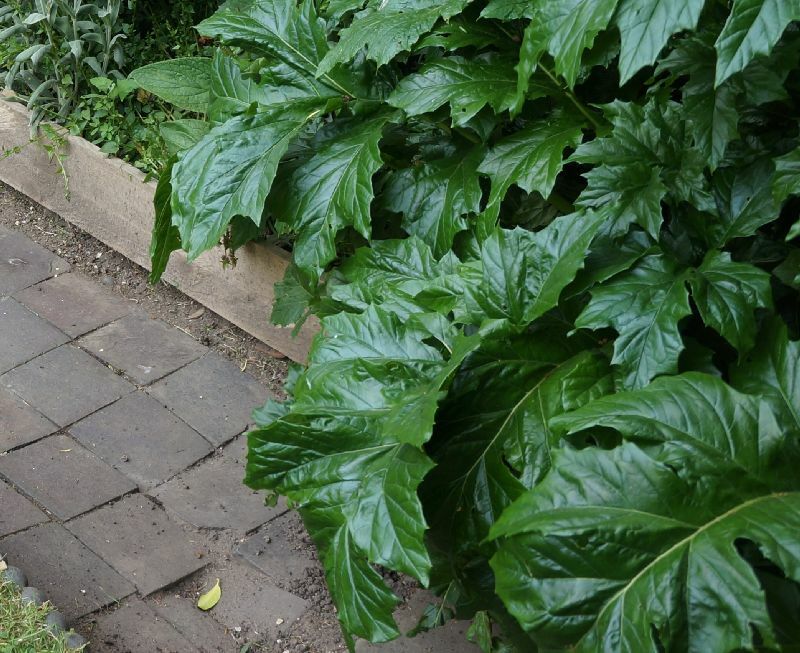 What Acanthus is not so keen on though, is being under the shade of evergreen trees, where it has to fight for its water and nutrients; it grows to a large plant and doesn’t do so well with competition. However, it will cope with being grown against a wall, so long as the soil is humus rich at root level. 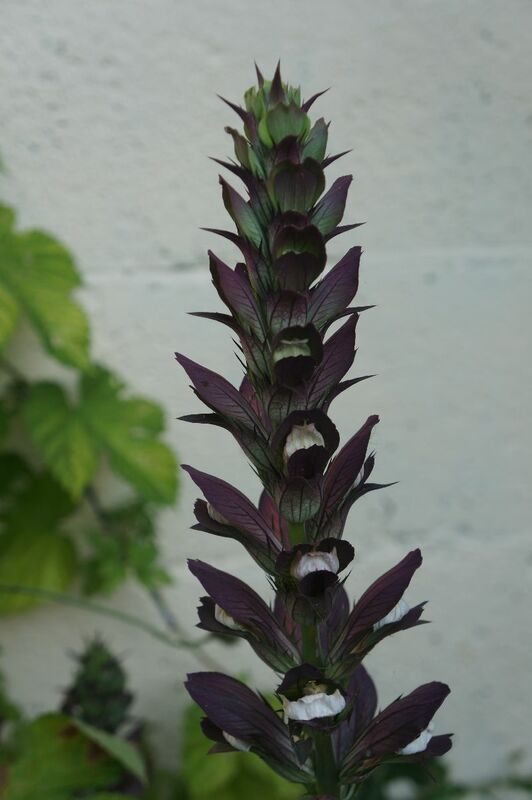 With its glossy green leaves and tall flower spikes Acanthus mollis suits both modern and cottage garden planting. Acanthus spinosus has similar leaves but with a spine at the tip – hence ‘spinosus’. 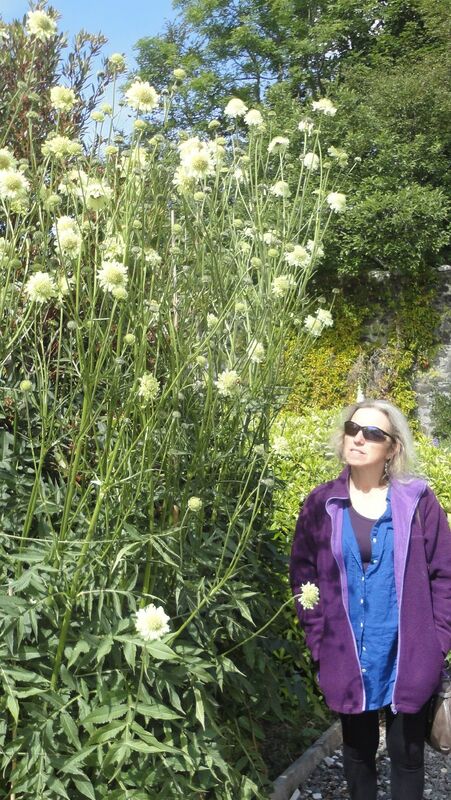 Giant scabious (Cephalaria gigantea) is a plant that is happy in the Isle of Skye, Cornwall, Greater London and all gardens in between. With large heavily dissected foliage and soft yellow flowers that are fascinating from bud stage to seed head this plant has to be a winner. 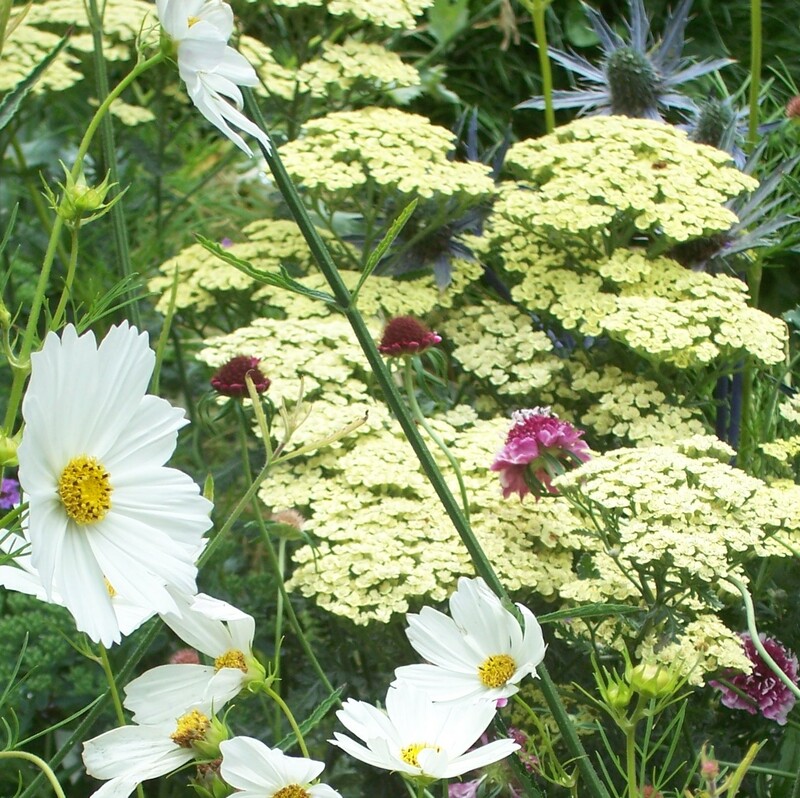 Bees and pollinating insects also adore the flowers, whilst birds enjoy the seed heads. The flowers are carried on long stems and may need staking in very dry conditions, so if you’re growing it against a wall or fence where it may not benefit from rainfall, be sure to dig in lots of organic matter into the soil when first planting. 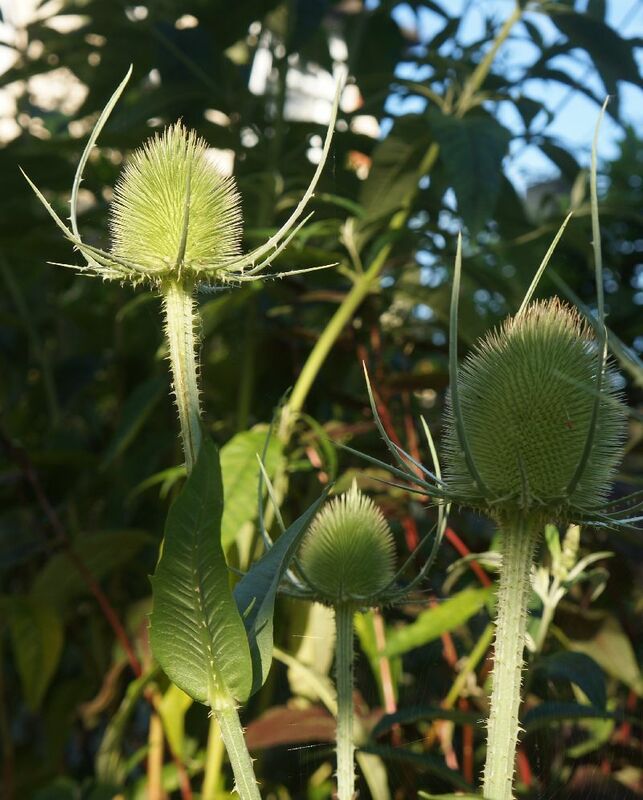 Teasel (Dipsacus fullonum) is a British native species. I’ve cheated a bit as this is a bi-ennial not herbaceous perennial, but once established by sowing seed two years running you will have plants every year. 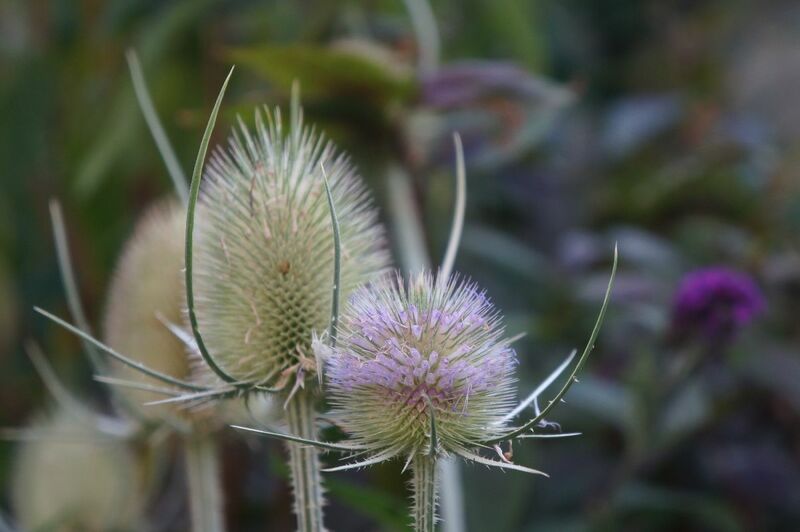 As with the Giant Scabious, Teasels are a popular feeding plant for wildlife. 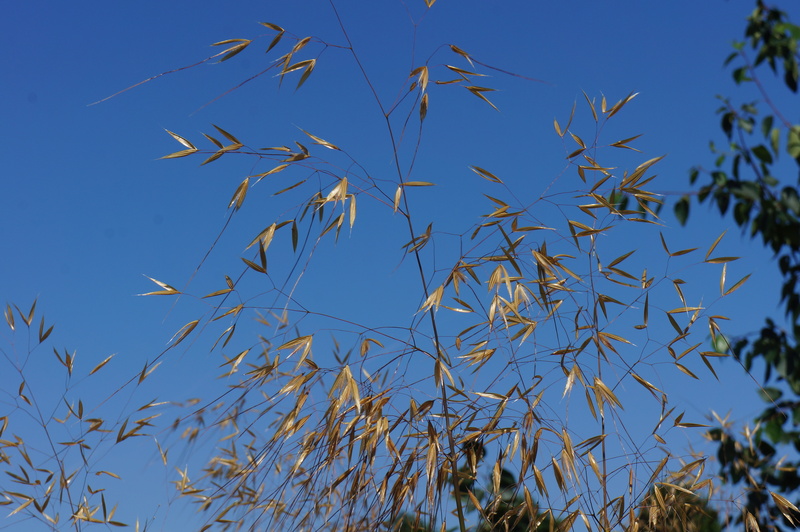 The seed heads often last right through to the following spring, although the birds will have eaten the seed off well before then. 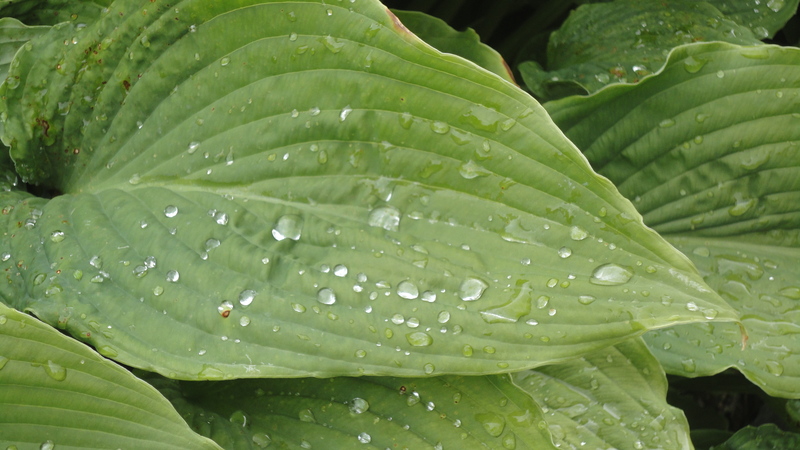 One lovely feature of these plants is the way rain water collects in the cup like depression of the leaf where it meets the stem. 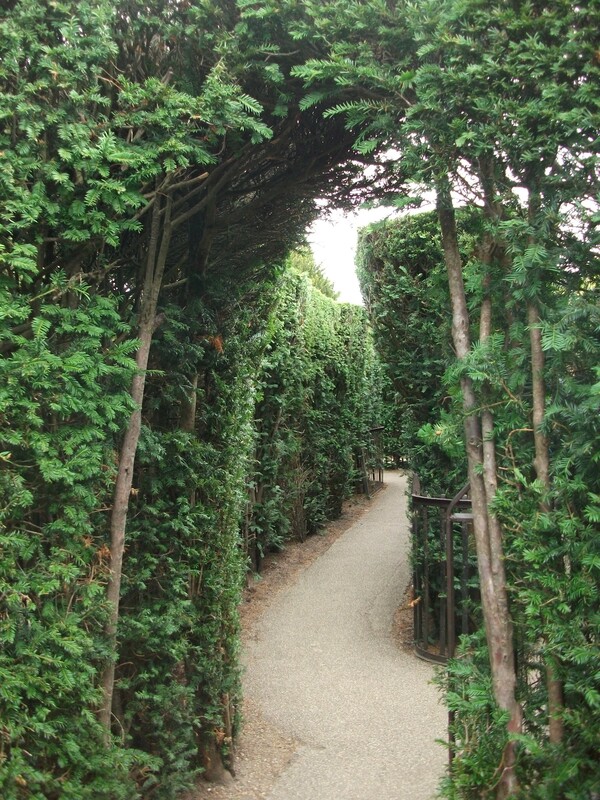 Both stem and leaves are covered with prickles, so it’s a good idea not to plant too near a path or seating area. When established, Giant Scabious and Teasel both have a tendency to self seed with enthusiasm but the seedlings are easily recognisable and simply removed by hand or with a dandelion trowel. Hopefully this selection has given you some inspiration for adding a different type of plant to your garden – one which once established you can wave goodbye to when you venture on your summer holiday, knowing it will be quite happy while you’re away. 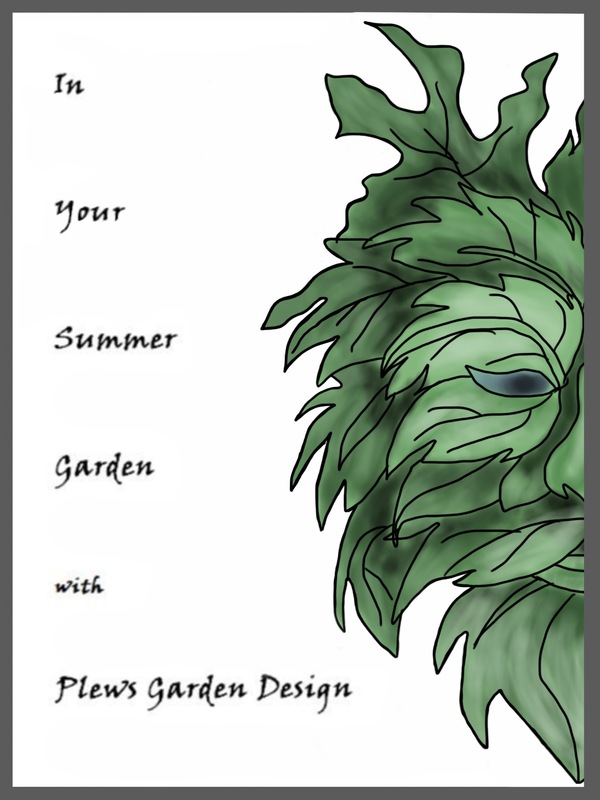 “In Your Summer Garden with Plews Garden Design” – the newest in our eBook series of Gardening Almanacs makes good reading wherever you are. 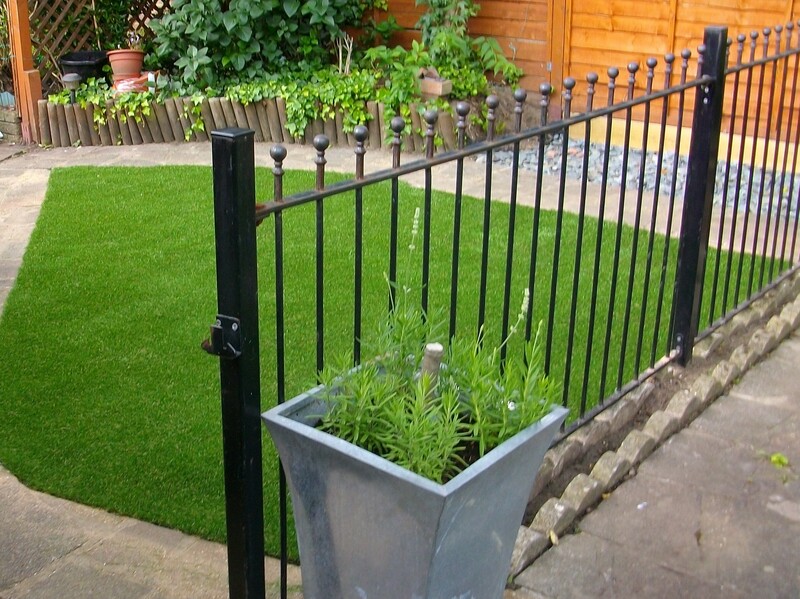 Lawns – is the Grass always Greener over the fence? Lawns have been around in Europe for some thousand years, although not always a recognisable lawn in the contemporary sense. Early lawns were really the grasslands which surrounded castles, giving a clear view of approaching visitors and enemies. They were also common meadow on which sheep and cattle were grazed. This was true until the eighteenth century when a cheap labour force enabled rich landowners to create and maintain lawns using men with scythes. Lawns became popular with a wider range of society after the invention of lawnmowers in England in 1830 by Edwin Budding. 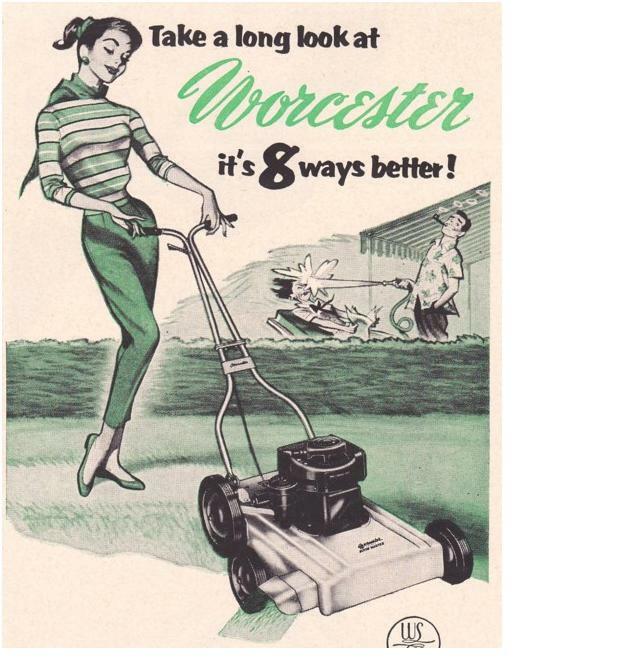 They were originally manpowered, push mowers; although petrol mowers followed fairly soon after in the1890s. 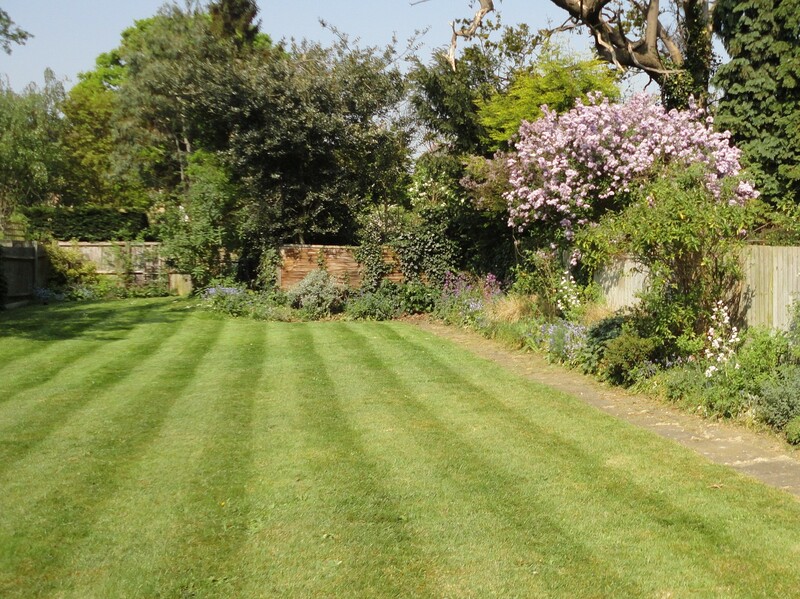 Mowers became universally available after the First World War and so the tradition of an English lawn was born. However, not all grass is as green as it looks. There are issues with productive farmland being used to produce turf for the domestic and sports markets rather than using the land for food crops. 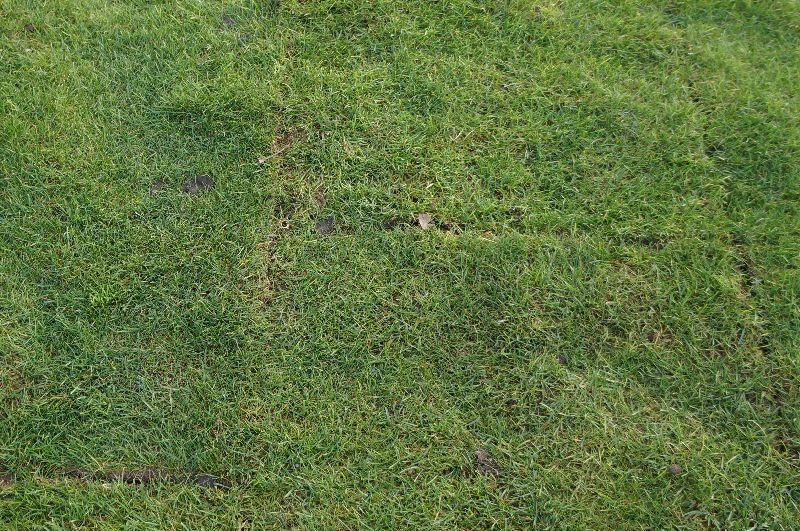 It’s not just the turf that is taken up and transported away; about one inch of topsoil comes away with it; that top soil then needs replacing. So if your lawn needs repairing or replacing what choices do you have? You could choose a ‘regular’ turf or grass seed lawn. If you need a good sized area for children to play on this is the traditional option, but you may like to consider artificial turf. Artificial turf, first used on sports pitches, can be useful in at least some parts of a family garden. Think of it as an alternative to bark mulch in a play area or under a trampoline where the real grass would normally die off. With good preparation of the sub surface, it can conform to safety standards, particularly in relation to children falling off play equipment. Many dog owners also find it a useful alternative to a paved area, and we have laid it for a client for this reason; a mid range rather than a luxury quality turf was used. 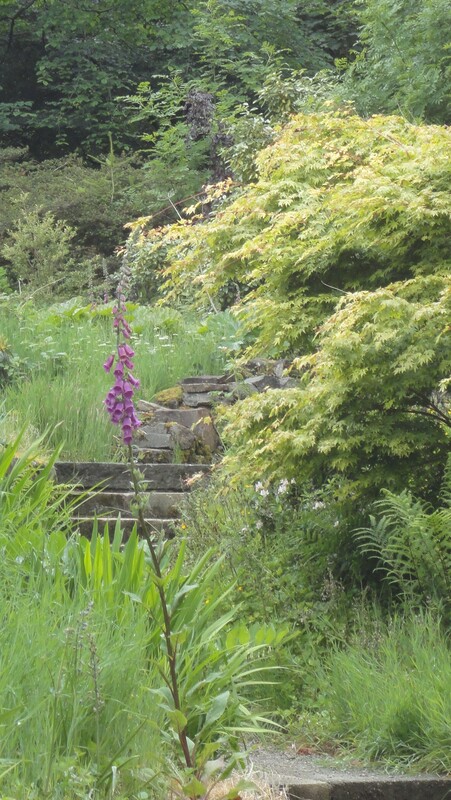 Mixed with well planted borders it can make an attractive and easy maintenance garden. You will need to rake leaves off in the autumn, and raise the ‘pile’ a few times over the year, but it is still an option worth considering for many busy families. For example, no lawn to mow and mower to maintain; the children can play on the surface more quickly after the rain as mud is not an issue. But you may prefer a grassy sward in your garden. Starting a lawn from seed is cheaper and there is more choice in the type of grass available; you can choose a combination of grass varieties that will most suit your needs. 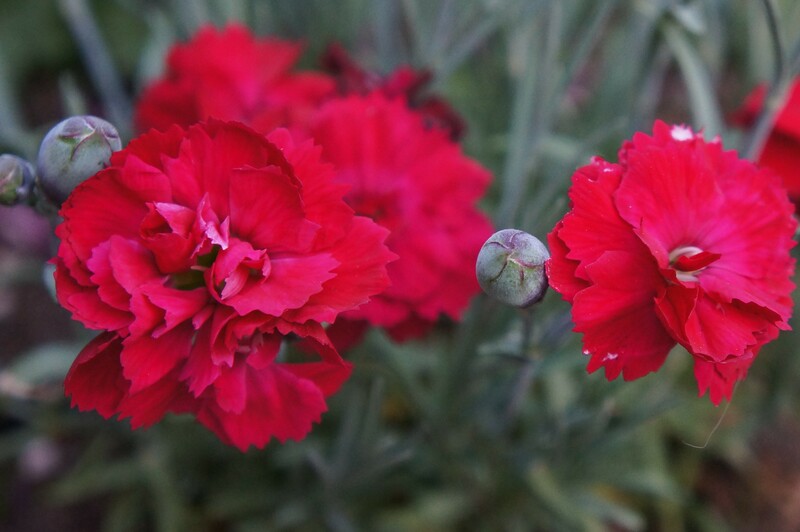 For example, you can get mixes that are hard-wearing or do better in shade. You can also make it more wildlife-friendly by adding clover. Clover is a member of the pea family and its roots fix atmospheric nitrogen, or fertilising the soil in a way that helps grass grow. This is best added after the grass has started to germinate and grow. 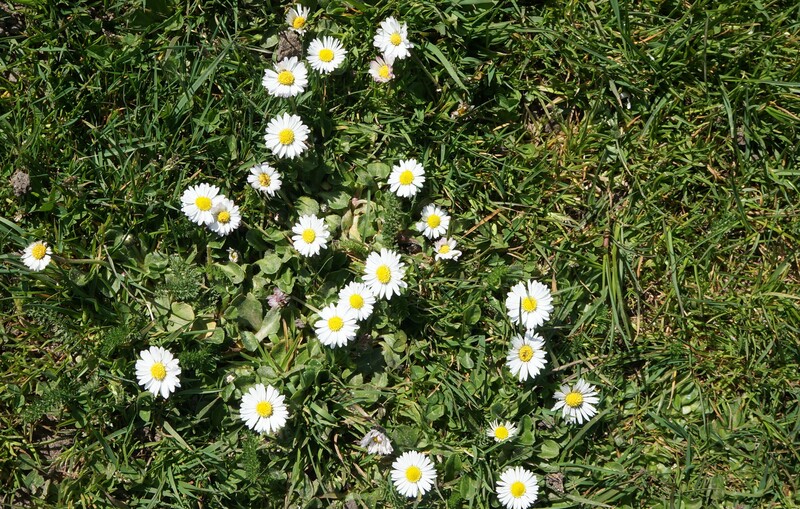 In fact many wild flower seeds can be added in this way, so if you want a lawn full of daisies for making daisy chains you can have one. This is a more practical option for many small gardens than a full wildflower meadow with paths cut through it. For areas which are not subject to heavy wear, an herb lawn is also a non-mow option that can still be walked over and sat upon. You don’t even have to deadhead the flowers if you don’t want to. 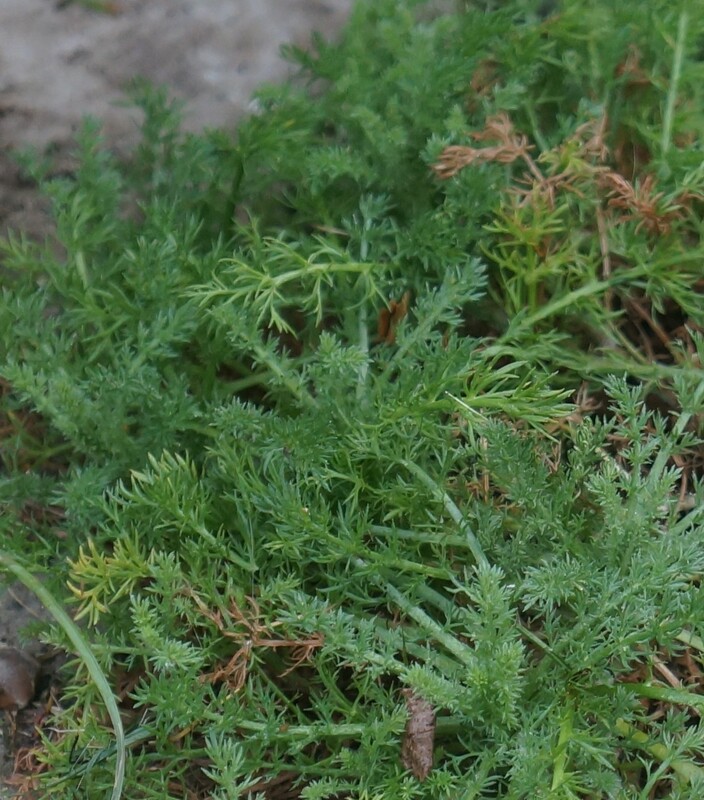 Non-flowering species such as lawn chamomile are perfect for a sunny spot, and scented when crushed underfoot. 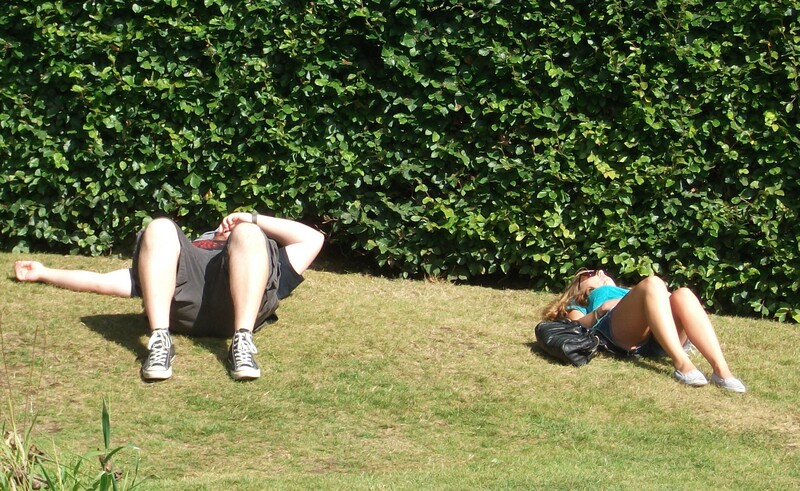 Creeping Thymes and creeping Mint lawns are other possible. 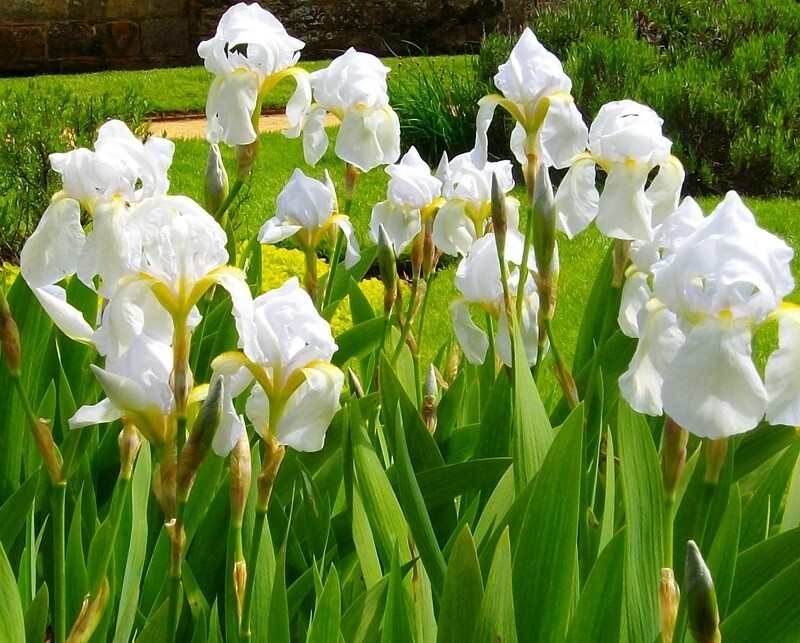 There are a surprising number of plants which are suitable for both sunny and shady lawn areas. There are many factors to consider before deciding which option best suits your needs for a lawn or non-lawn. For example, there are the practical, the economic, the biodiverse or environmental and the aesthetic. I don’t think a thousand years of lawns are going to disappear just yet, but I do think they are in for a change. 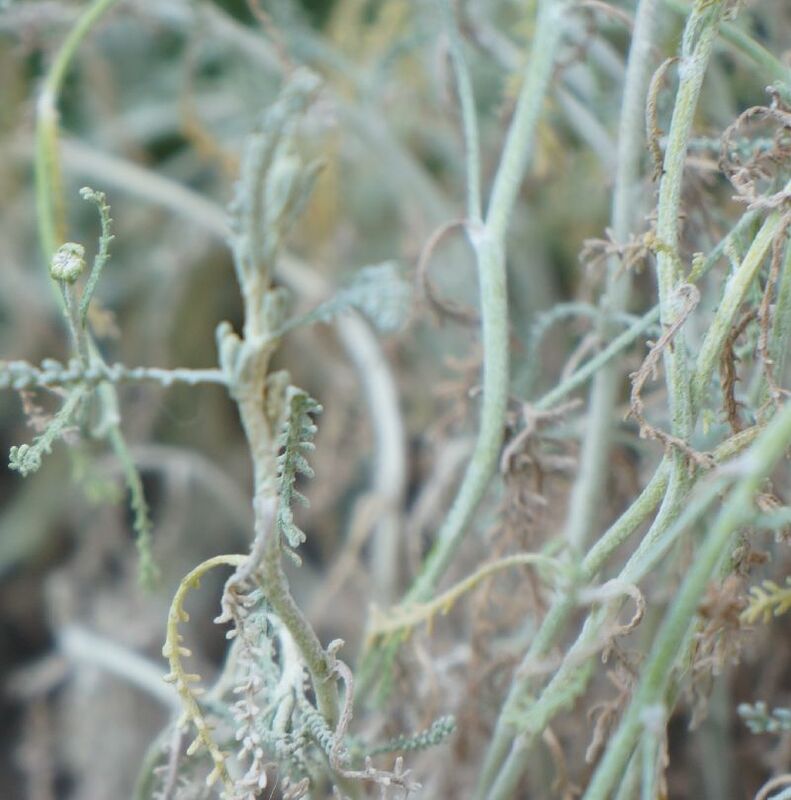 We thought a roundup of some of the gardens and exhibits that caught our eyes, amused us, inspired us and educated us from our visit this week might just be the sort light entertainment that you’d enjoy. 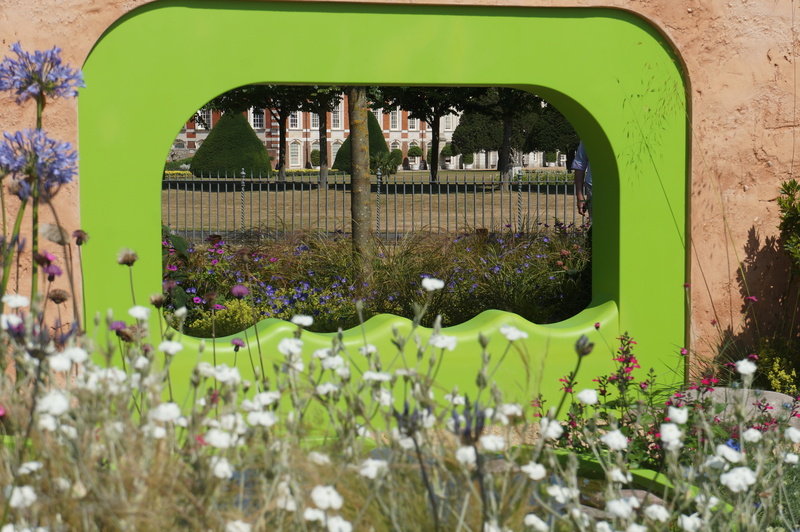 This year the RHS Flower Show at Hampton Court has been given a different layout, with three main zones – Grow, Escape, Inspire – and the various Show Gardens, trade stands and demonstrations fit into these. 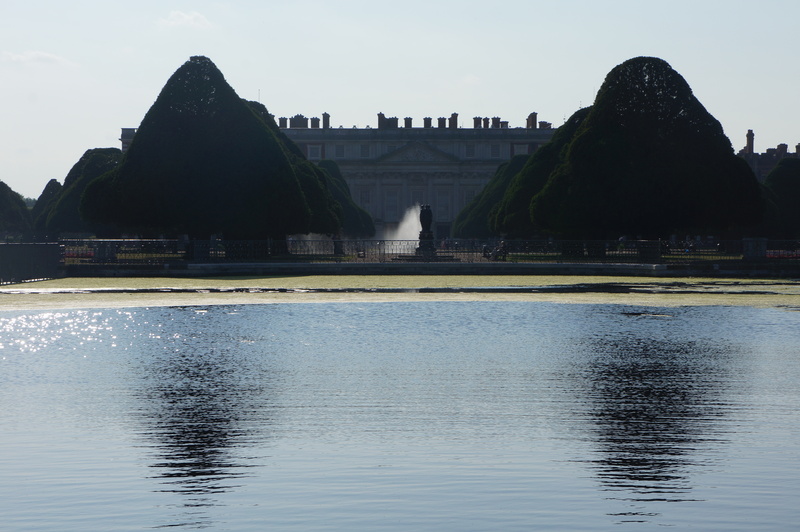 Naturally, the inclination is to wander and to back track, and at Hampton Court there is plenty of room to do that, and to stop for a coffee, an ice cream or a Pimms by the Long Water, which divides up the show areas. 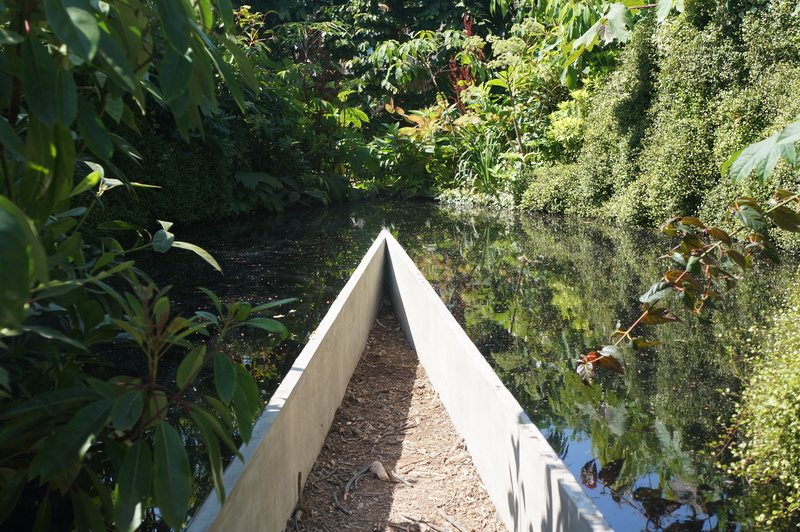 The Long Water is the canal excavated during Charles II’s reign in 1662 as part of the refurbishment of the gardens. The idea was to bring the English palace gardens up to the modern and innovative standard of the Versailles gardens; Charles was in many ways a forward thinking monarch, and had spent much of his exile during the Commonwealth years in France, so it is no surprise that he was a lover of Le Notre’s French style of gardening. There were plenty of hot colours to contrast with the cooling water, and not only in the gardens. 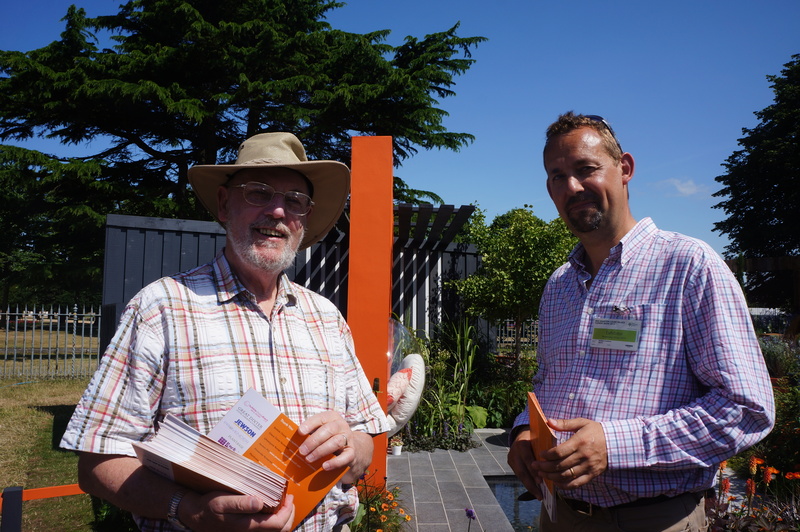 Congratulations need to be given to an old friend’s son, Graeme of Outdoor Creations, who constructed the Best in Show garden in the the Low Cost, High Impact section. Loved the hot orange wall in this garden. The overall Best in Show winner was the Ecover garden. We liked their clever placing of the ‘window’ to make use of the views beyond the garden. 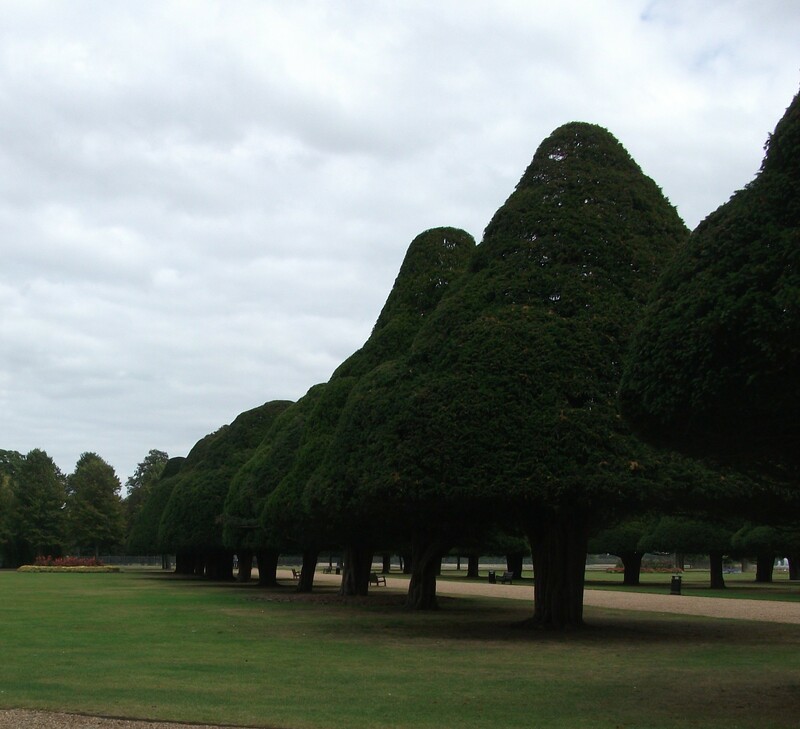 It’s a trick that garden designers often use, although we don’t all have a royal palace in the distance. 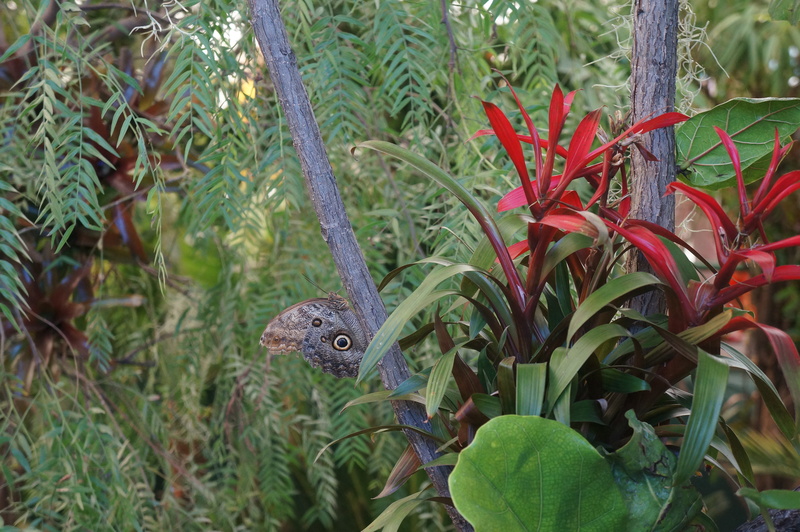 We found the Butterfly dome and Bee garden in the Escape zone; fascinating. In the Grow zone on the far side of the Long Water we found the Plant Heritage Marquee; you may have read about them in other blogs of mine.Plant Heritage is the world’s leading plant conservation charity and its members include people like yours truly, but also gardens and individuals who give their time and garden space to hold ‘National Collections’ of one or more plant genus (that means group of plants that are related, to the non-botanists amongst you). This year is their thirty-fifth anniversary. 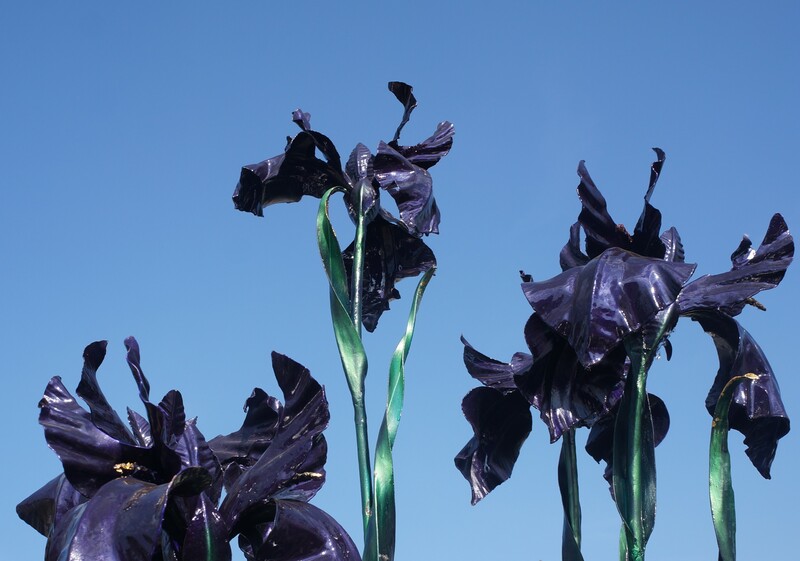 These irises really caught our attention; they’re not real, but a water feature created by Neil from Dragonswood Forge whose work we adore. We’re back to water again; but that’s not surprising, the large RHS London Flowers Shows – Chelsea and Hampton Court are both set on the banks of the River Thames. 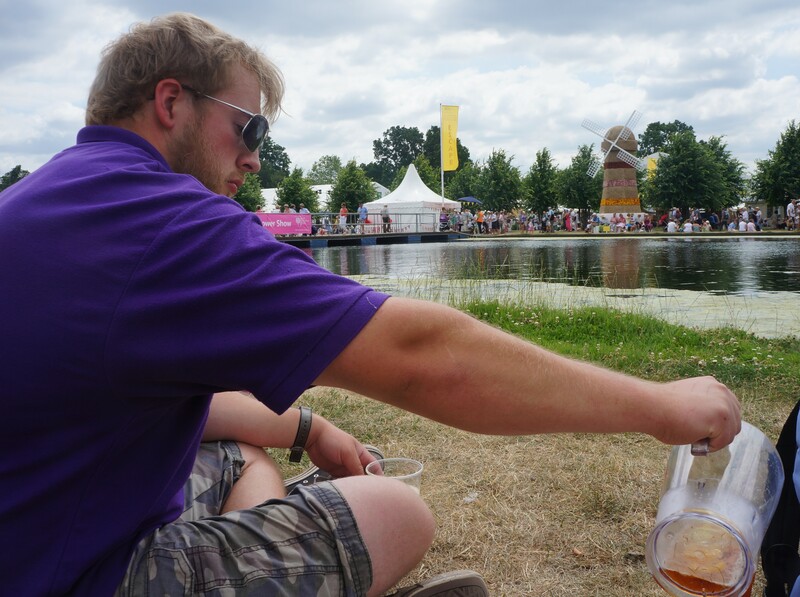 At Hampton Court the Long Water provides a means of separating show areas, but more importantly provides a long, sociable stretch where you can sit and discuss the gardens and just watch the rest of the world go by for a time. 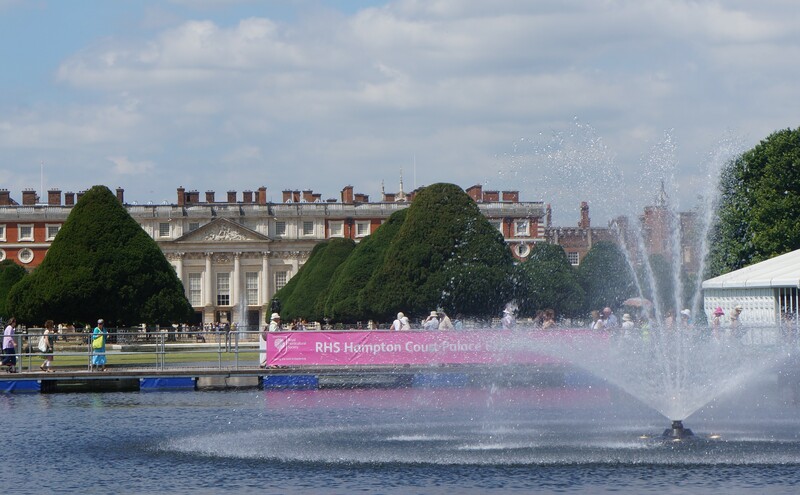 Wimbledon may be nearly over, but we can look forward to another busy week in south west London as the Royal Horticultural Society (RHS) holds one of the world’s largest flower shows at the Royal Palace of Hampton Court, on the banks of the Thames. 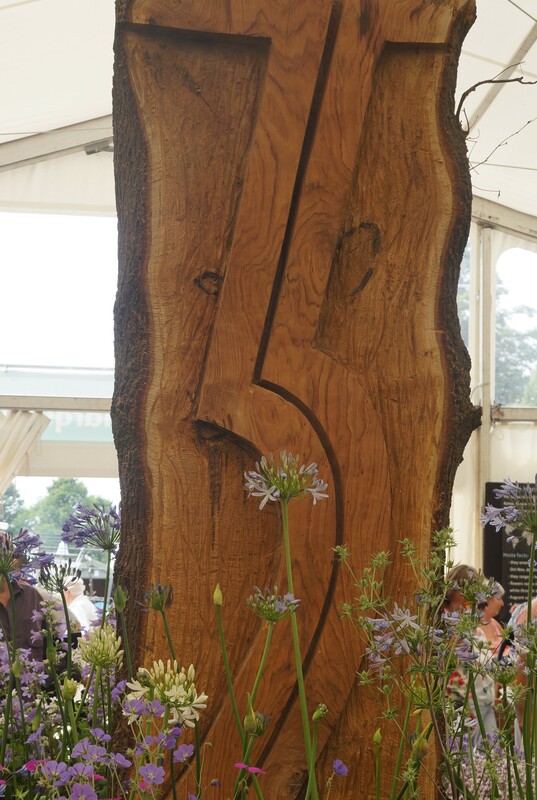 The RHS Show is held in the grounds rather than the gardens, and it is an event that we thoroughly enjoy. But as we spend all day at the show, there’s no time to see the Palace and gardens, so last September, we visited the gardens. 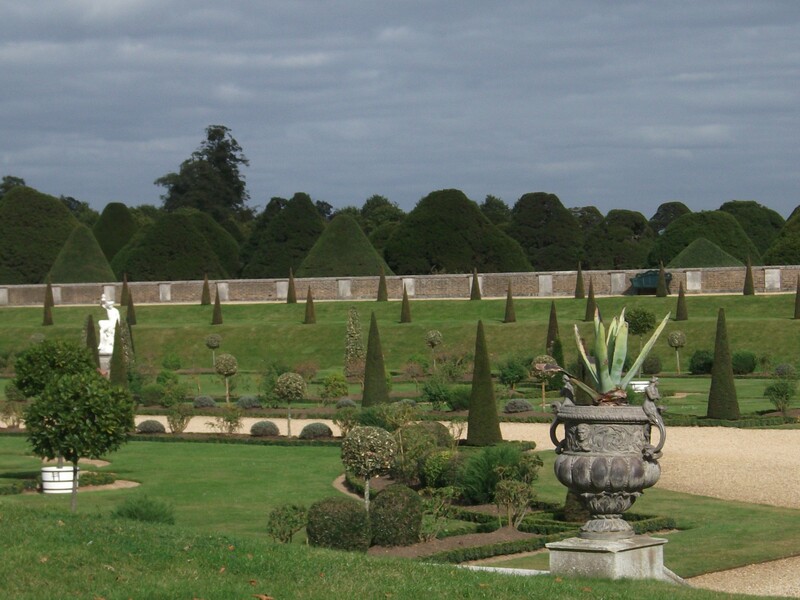 Here we share some of the delights of this historic garden with you. 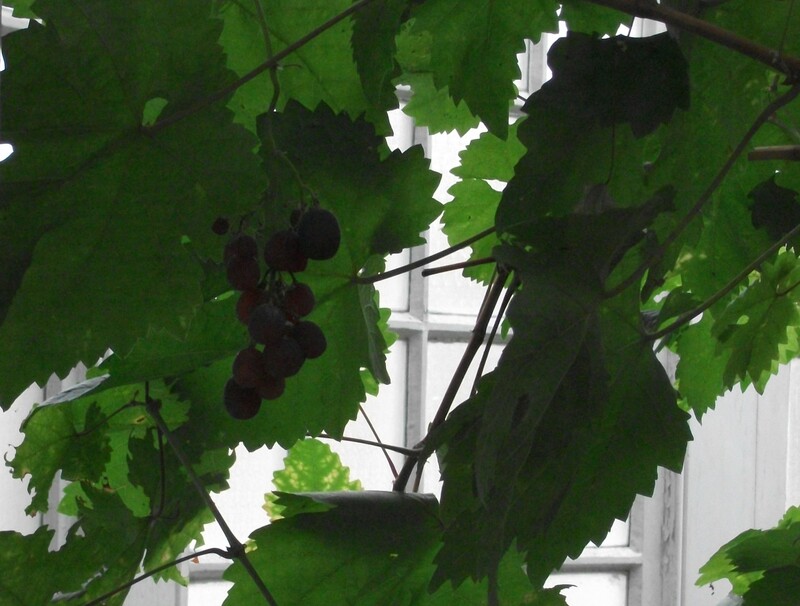 The Great Vine was originally planted in 1768 by Lancelot ‘Capability’ Brown, who is probably better known for his restructuring of many formal gardens into sweeping landscapes on estates across the country. The Privy Garden is a re-creation of the 1702 design for William and Mary. The formal rhythms and use of much evergreen topiary makes it a quite a contemporary space, and offers ideas that could be transposed into an easy maintenance twenty-first century garden. Hampton Court’s Maze dates from 1690; it’s supposed to take about twenty minutes to reach the centre – I think Nathan took a short cut though. 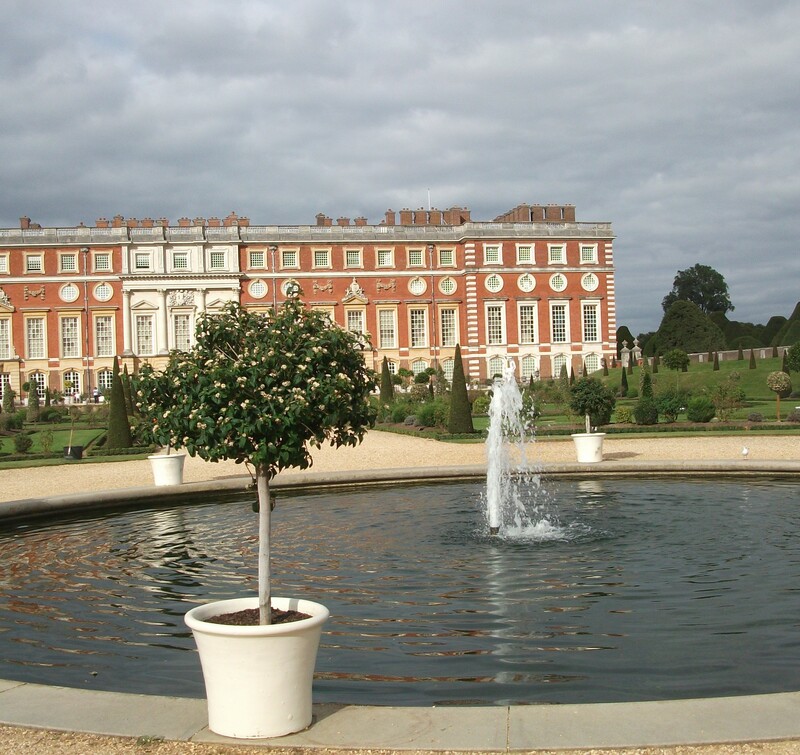 The Exotic Garden was developed for many botanical species that were brought to Hampton Court Palace for the monarchs William and Mary. 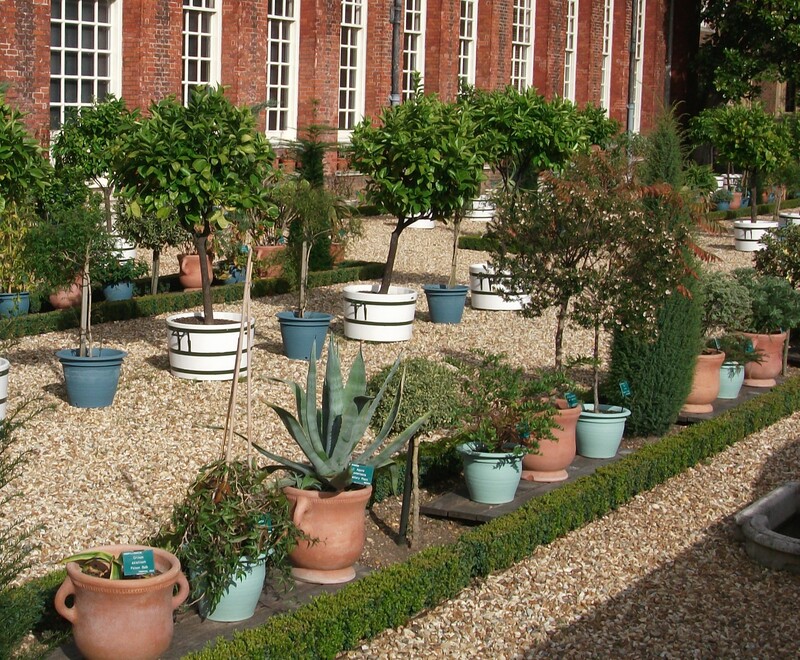 Their collection had over 2000 specimens, grown in large pots which were relatively easy to move between their summer home in the exotic garden and their winter home in the orangery. The plants needed winter protection as most would not tolerate a British winter, but could still be on display. The Hampton Court Lower Orangery Gardens is a unique restoration and very much a living history display of botanical and social importance. The great fountain gardens are visible if you visit the RHS Flower Show. When you walk across the Long Water to get from one section of the show to the other, look towards the Palace. 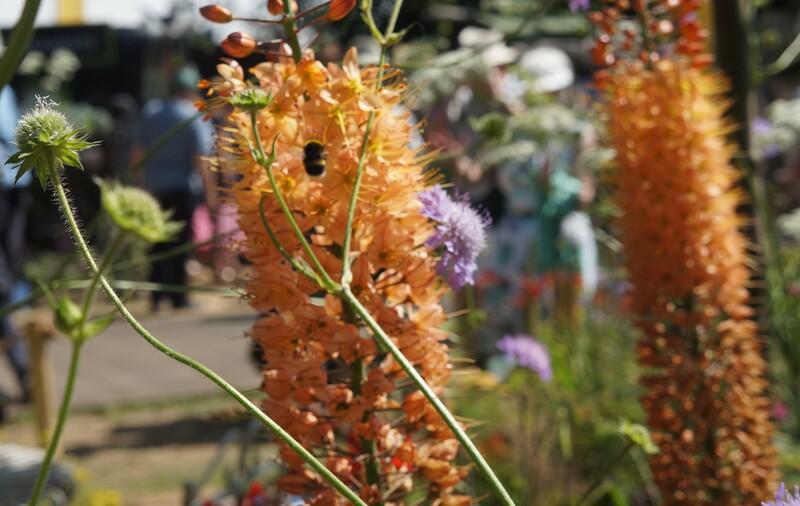 We’re looking forward to visiting the Flower Show next week and being inspired by gardens; promise we’ll share some of our favourite gardens and plants with you from this year’s RHS extravaganza. 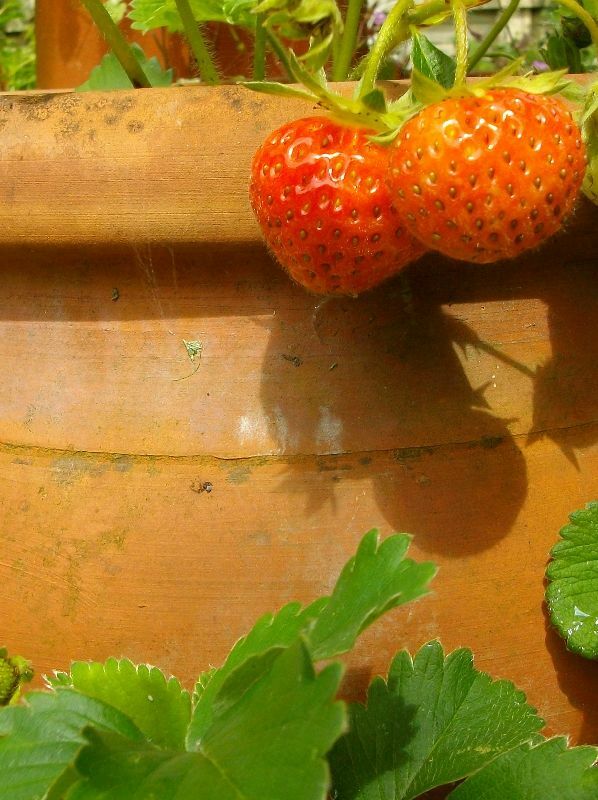 Summertime brings major tennis tournaments for us to watch whilst eating the fruit of our labours in the garden; strawberries, raspberries, salads. In Britain we host Wimbledon for a couple of weeks in June and July. One of the delights of a summer garden has to be picking your own strawberries and eating them straight away, sweet and still warm from the sun. 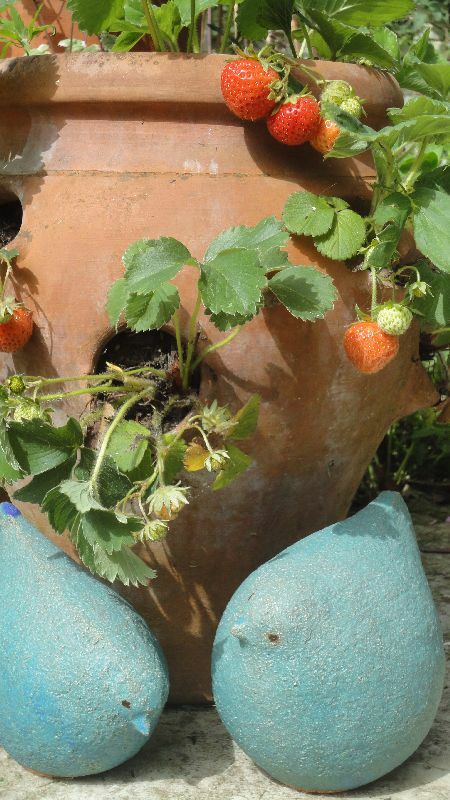 Strawberries do well in containers, and in small areas; special strawberry pots with holes around the sides or hanging baskets both maximise space and are often easier to keep slug free. These could be kept outside or kept in a cool greenhouse for an earlier crop. Kent growers supply virtually all the 8000 punnets of strawberries that tennis watchers eat daily throughout Wimbledon fortnight. Yes, you did read that right, nearly 8000 punnets of strawberries a day. On the positive side, they are local fruit, Wimbledon being in the South West of Greater London (or in Surrey, or London Borough of Merton, boundaries sometimes being in question) so it rubs geographical shoulders with The Garden of England. Strawberries were eaten by the Greeks and Romans. This wasn’t the cultivated ‘garden’ strawberry (Fragaria ananassa) that we know today, but a much smaller fruit, the wild strawberry (Fragaria vesca). 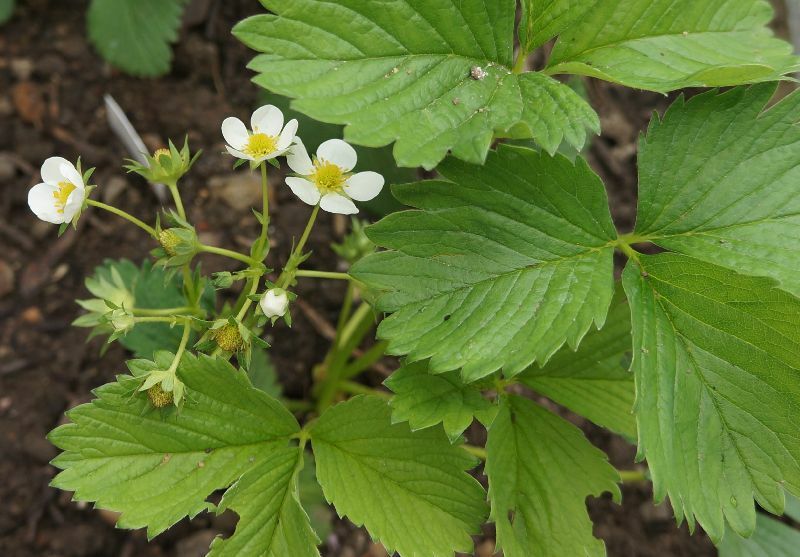 Although they’re both members of the rose family, the garden strawberry is a hybrid. It was first bred in Brittany, France in the 1750s, and then further developed in America; its parents are from both South America and North America. Nowadays, Kentish strawberries at Wimbledon are world famous, so it’s turned into a very cosmopolitan fruit! Strawberries are also seasonal; ie this is the time of year for strawberries in the UK; which is why the legend of King George V introducing the eating of strawberries and cream whilst watching tennis at Wimbledon is so popular. In 1907, George V, then Prince of Wales attended Wimbledon and did eat strawberries and cream. But it is perhaps more memorable a date for being the first time the Centre Court was protected by a tarpaulin. Typical British summer weather, then! As for the tradition of eating strawberries and cream, according to the Wimbledon Lawn Tennis Museum, it started with the first Wimbledon tournament in 1877. So why strawberries and cream in particular? Well, we’re back to seasonality. We may now be able to eat strawberries year round, transported from various parts of the globe; back in 1877 it was a different story. Although frozen meat was beginning to be transported by this time (mutton was first shipped from Argentina to France in 1877) it involved quantities of ice. The first refrigerator patent was licensed in Germany in 1877; but it took a while for this to become a reliable method of preserving food. Strawberries are more difficult to transport any distance, as soft fruit is easily bruised and it’s more difficult to freeze them without causing discolouration and loss of taste, for example. So what is the connection between tennis and the Monarchy? Apart from strawberry eating that is. ‘Real’ or ‘royal’ tennis is so-called to distinguish it from ‘lawn’ tennis – which is the game played at Wimbledon. There are ‘royal tennis’ clubs in both Boston (home of the Tea Party) and Washington in the USA. It’s known as ‘court tennis’ in America, to distinguish it from lawn tennis. In Britain, Hampton Court Palace has its own indoor Royal Tennis Court, the oldest surviving ‘real’ tennis court still in regular use in England. It was part of the original Palace as rebuilt for Cardinal Wolsey in the early sixteenth century; before he thought it politic to give it to his lord and master Henry VIII. Henry Tudor must have played ‘real’ or ‘royal’ tennis in this court; he was quite an athlete in his youth. 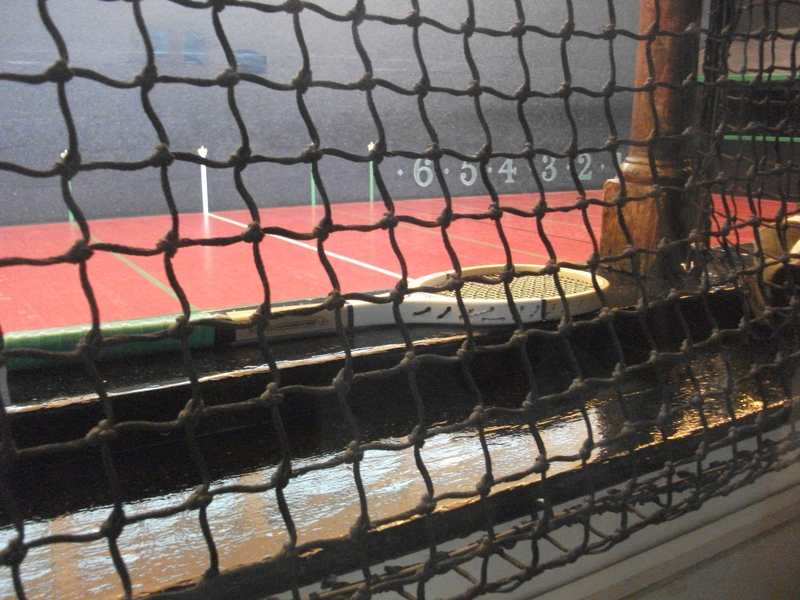 The court was last refurbished in the reign of Charles I, another tennis loving monarch. Are you on Facebook? We have a daily tip and photo you might enjoy – why not have a look? Planting inspiration from the historic Armadale Castle gardens on the Isle of Skye, where the Gulf Stream offers a mild climate and the chance to grow a wide variety of species, including many tender ones. Armadale Castle is the home of Clan Donald Lands Trust in South Skye. 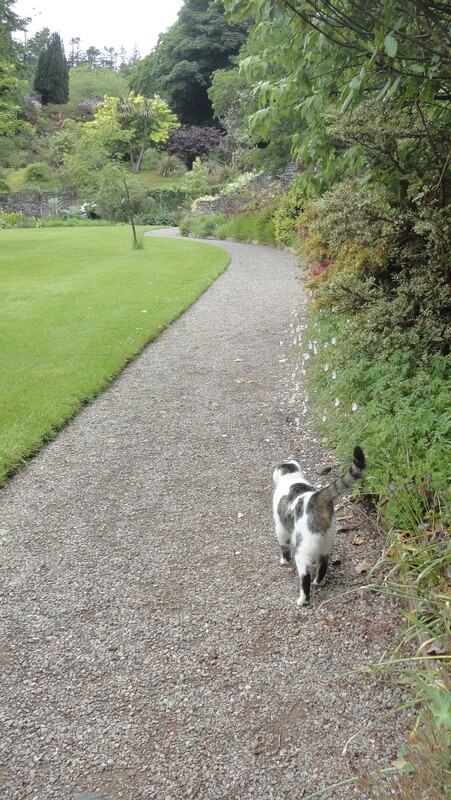 We visited last summer, on a somewhat damp day. 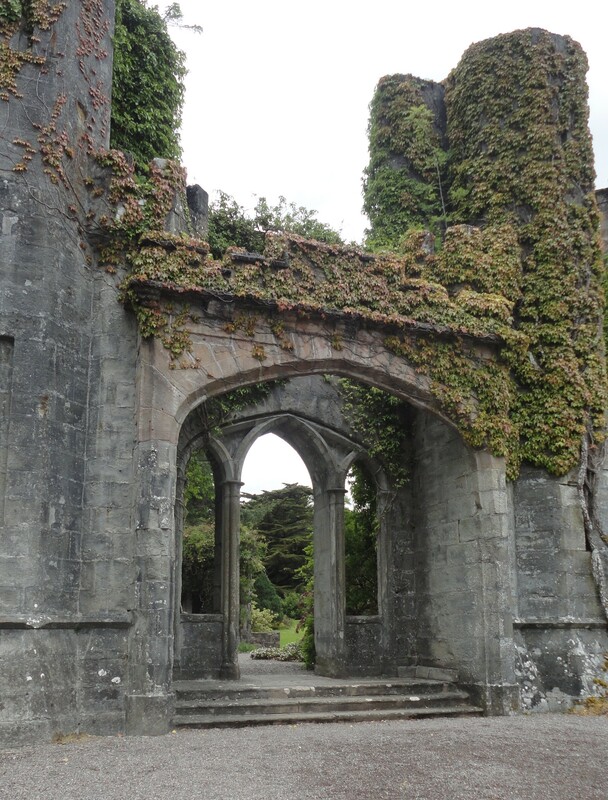 The ruined castle looks across to the mainland and formed the starting point of our walk through the gardens. 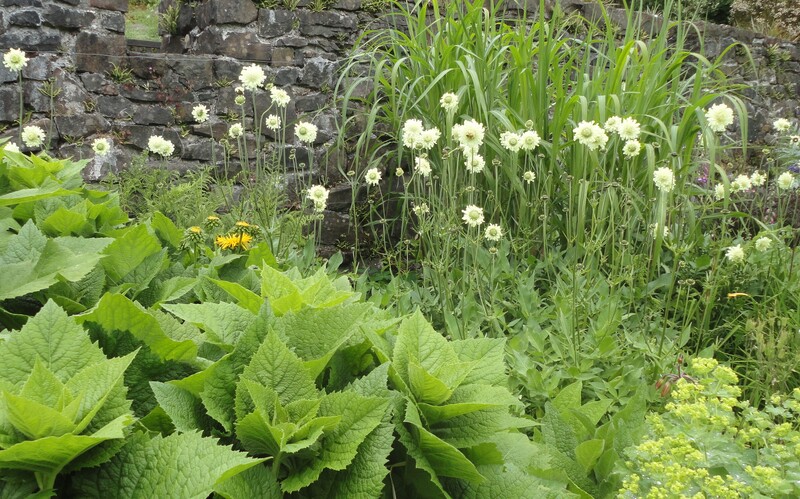 The yellow themed border with Giant Scabious (Cephalaria gigantea) and tall Elecampane (Inula), Achillea at middle height and low growing Lady’s Mantle (Alchemilla mollis) was in its early flowering stages when we saw it. 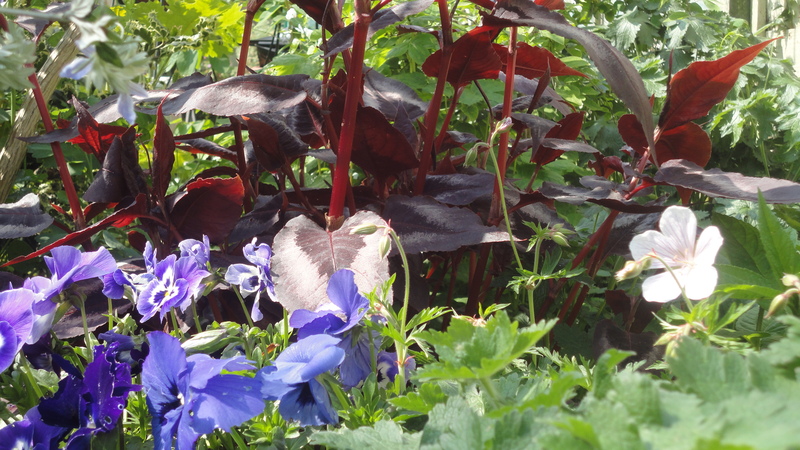 This was a good mix of plants, giving flowers from late April through to September, a range of heights that would change over the same period; and a variety of foliage colour and form. It’s the sort of mix that could look a mess unless you find a link between the different plants; here the link was, if I may sound artistic for a moment, that the flowers all had the same tone of yellow as their base, although the shades of yellow were different. We decided it was a bit too wet to explore the woodland trials as fully as we would have liked, but we did have the opportunity to see the Museum of the Isles which had some fascinating displays and educated us about the Lordship of the Isles. 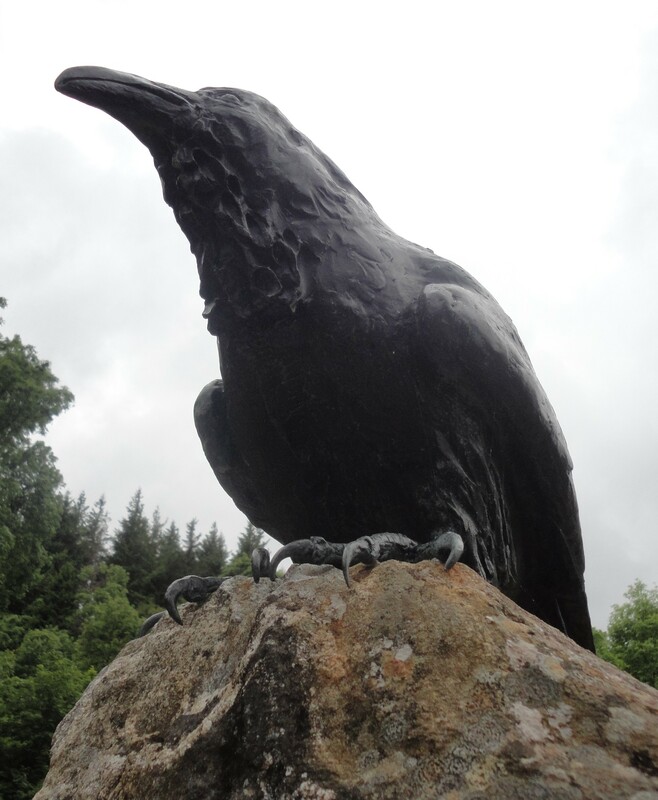 The Raven on the Rock memorial outside the Museum is stunning and eerily lifelike when first viewed through a mist of rain. The playful otter as a central feature to the pond was a welcome change from the more frequently found fish or small cherub. 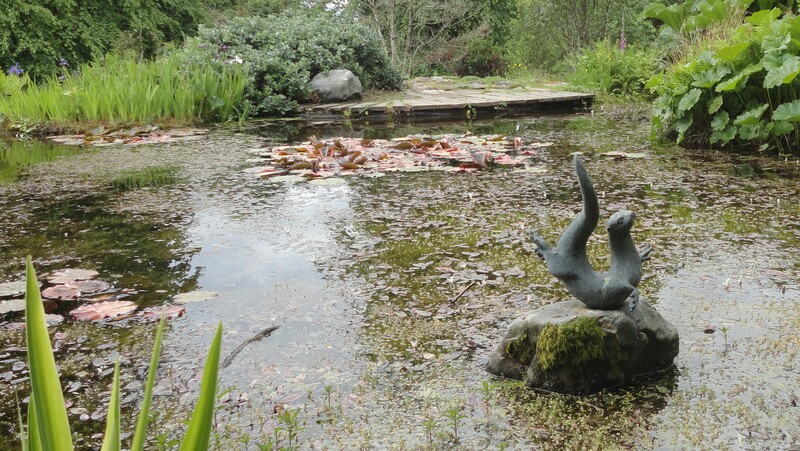 It is in keeping with the location of the gardens, and would look out of place in an urban garden; but the concept of adding a beautiful statue as the pond’s focal point, something which has meaning for the owner of the garden, is an idea worth considering. 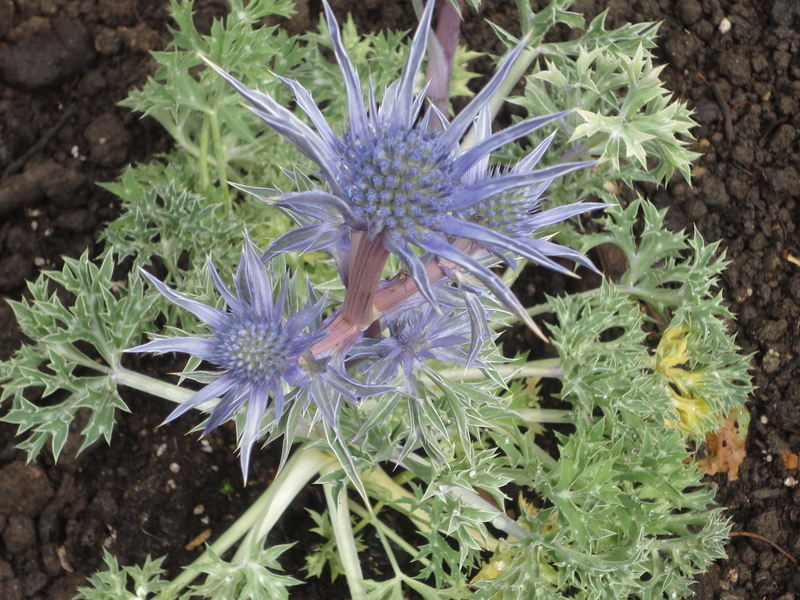 As well as planting inspiration, we came away with two new herbaceous plants, Geranium ‘hocus pocus’ with dark highly serrated foliage and mid purple flowers and Centaurea Montana ‘Jordy’ a perennial cornflower with almost black flowers, both of which we’d seen in the castle gardens. 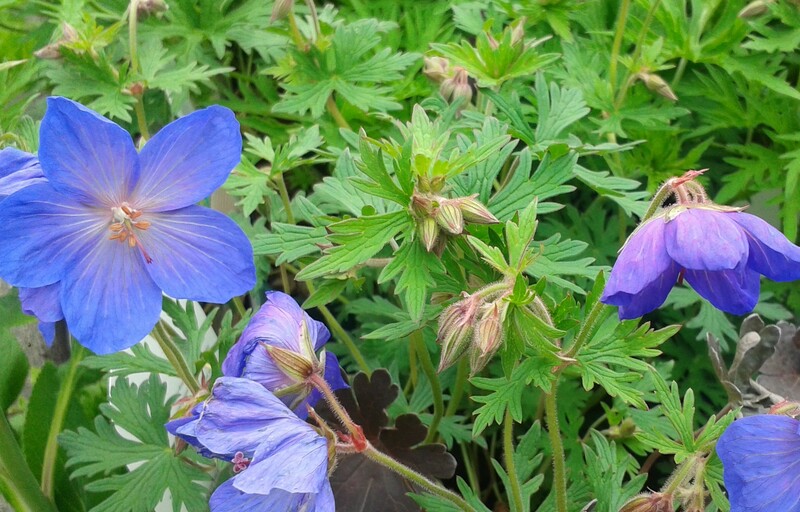 There were quite a few different geraniums in the borders; they do well in the damp conditions being mildew resistant unlike some herbaceous perennials. 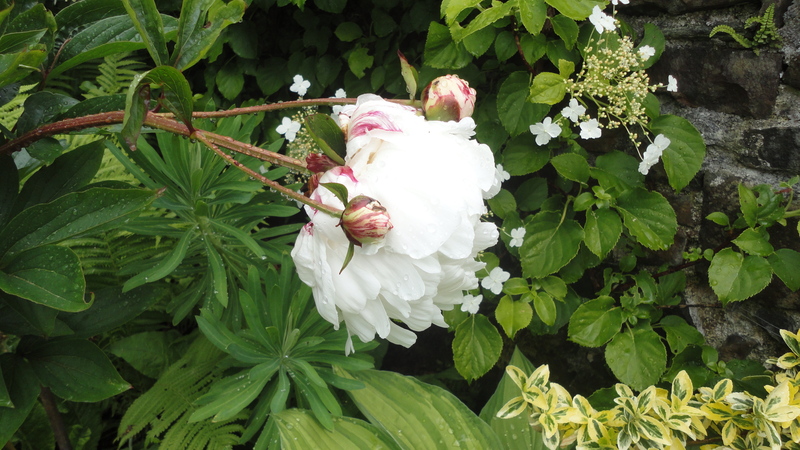 A factor worth considering if you have a damp shady garden, as many of the varieties will tolerate shade. 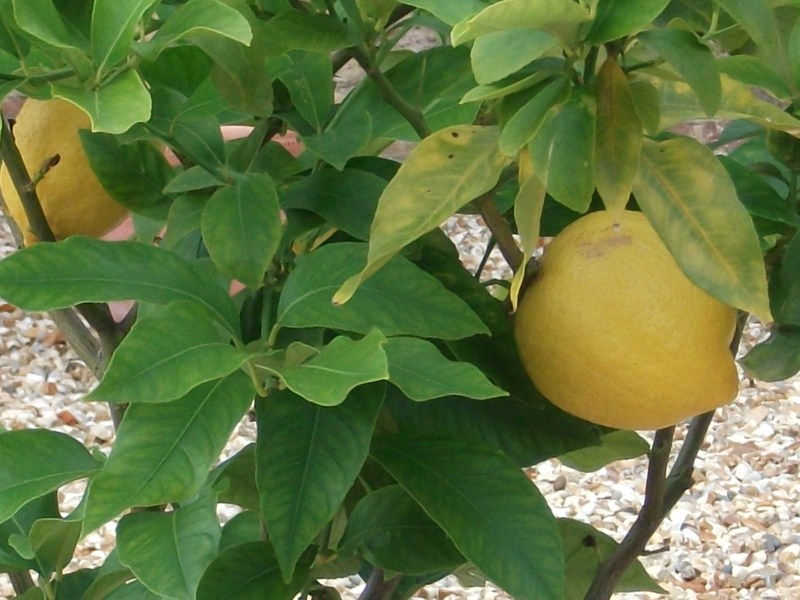 Many of them will also be happy in dry shade or even a south facing border; you just need to pick the right cultivar. The perennial cornflowers are more often found as blue flowering forms. 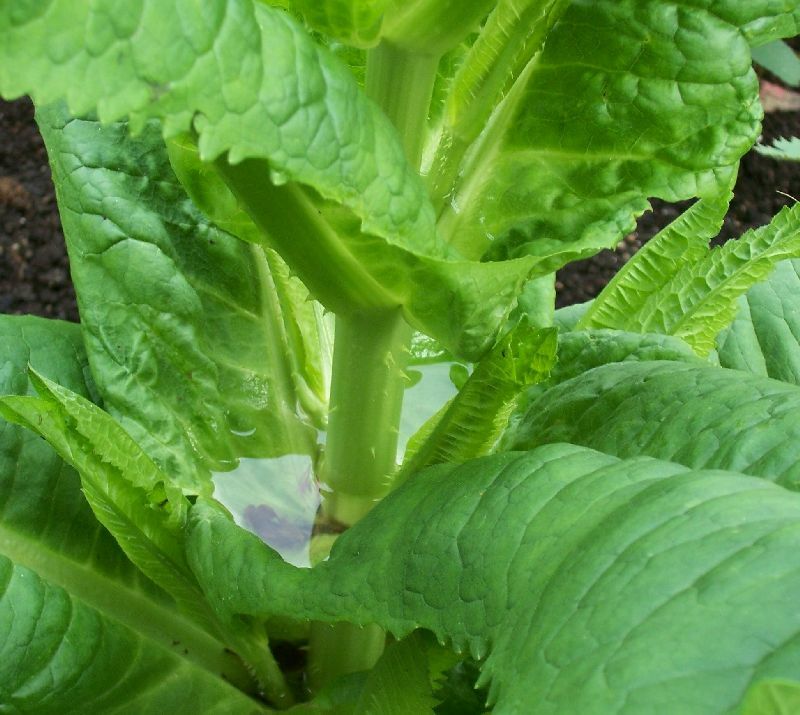 They can be prone to mildew, and to flopping; the best way to get round this is to cut them hard back after the first flush of flowers just as they’re starting to flop. 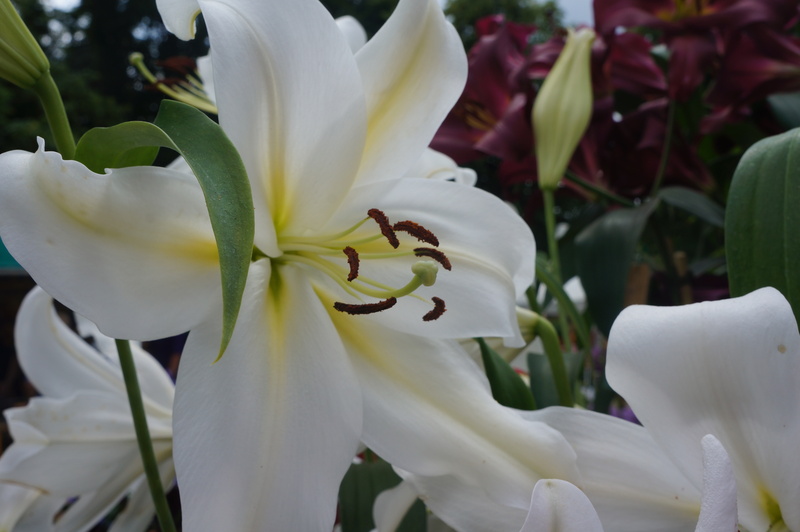 They will repay you by flowering again in only a few weeks; cutting the flowers to take into the house is another tactic to reduce the flopping tendency – and give you pretty flowers too. 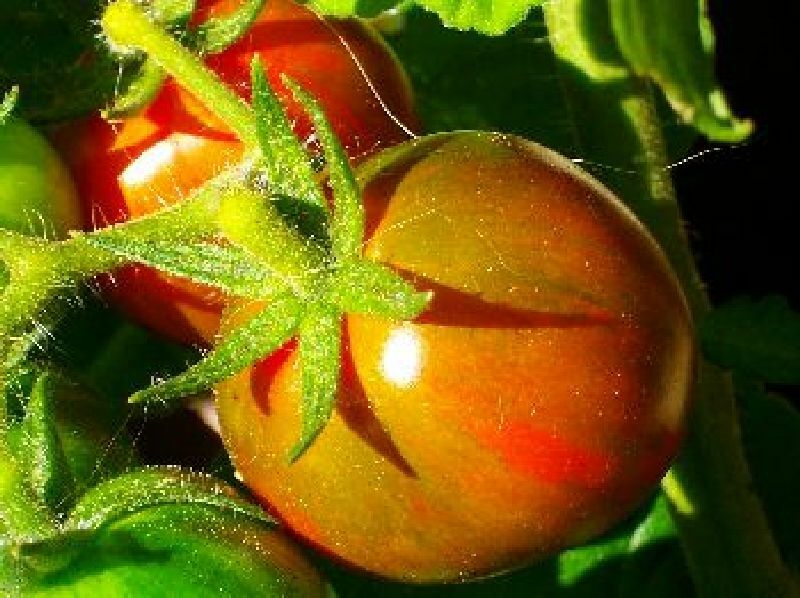 How does your garden grow: colourful in the spring and then all green in the summer? If you missed out on using last year’s Diamond Jubilee as planting inspiration why not celebrate sixty years since the Queen’s Coronation instead? 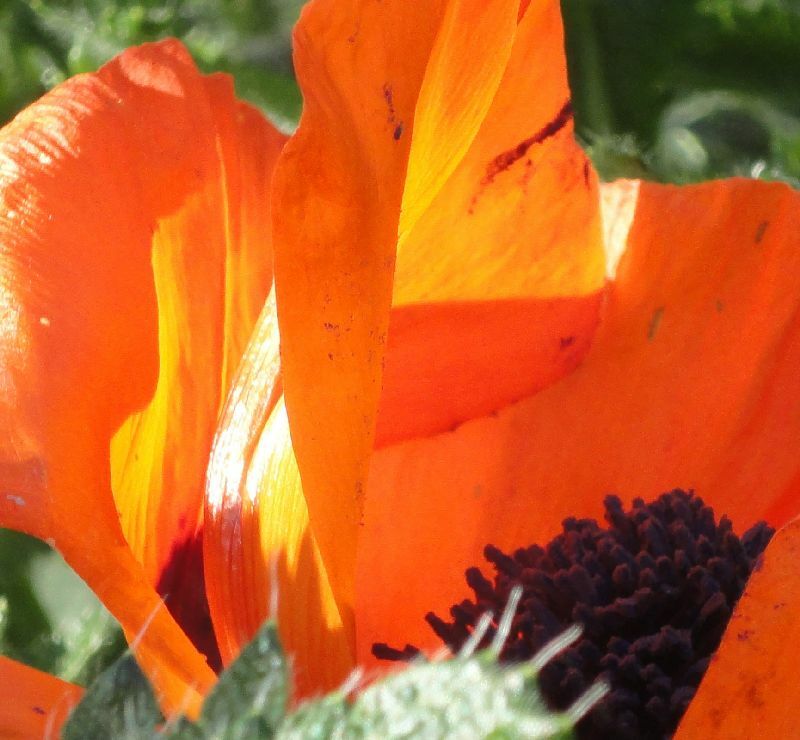 The plants below flower during the summer months so will brighten up your garden. Plant them in combination: for example, one white rose at the back, three blue delphinium and five low growing red dianthus at the front. You could even have Coronation colours in the vegetable garden with red strawberries, blueberries and white currants…well, at least until you ate them! 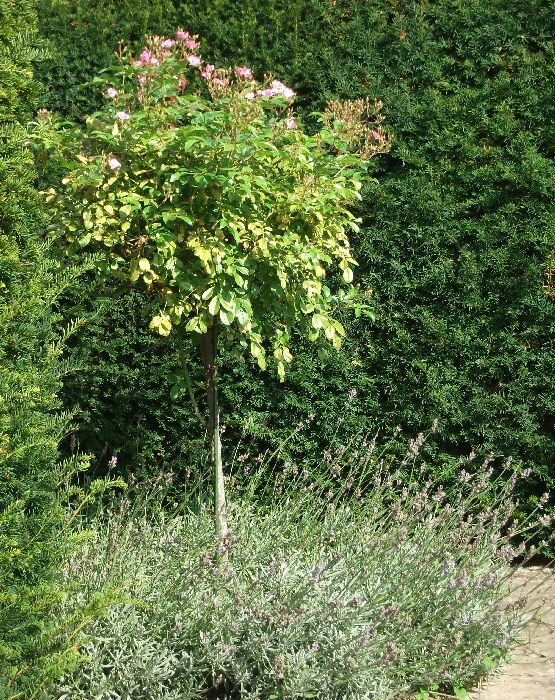 Plews Garden Design offers design and build gardens and planting designs for borders. Drop us an email with your query.